Homepage. This page: Photographs of 'mystery' motorcars, plus unidentified vans, lorries and early motorcycles. Some of the photos shown on this page were sent in by visitors to this site, other pictures I've found in junk shops and purchased off the net. 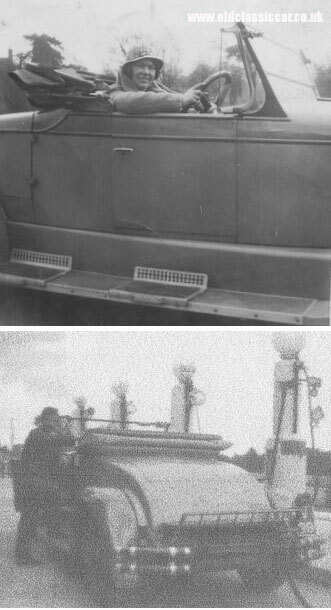 All clues as to the identity of the cars, lorries, coaches and motorcycles shown in these photographs much appreciated! Click on any thumbnail for a larger view of the photograph. Many cars in photographs I've been able to identify straightaway, in which case they went straight into the Period Car Photographs pages instead. As pics on this page are identified, I'll update their descriptions. 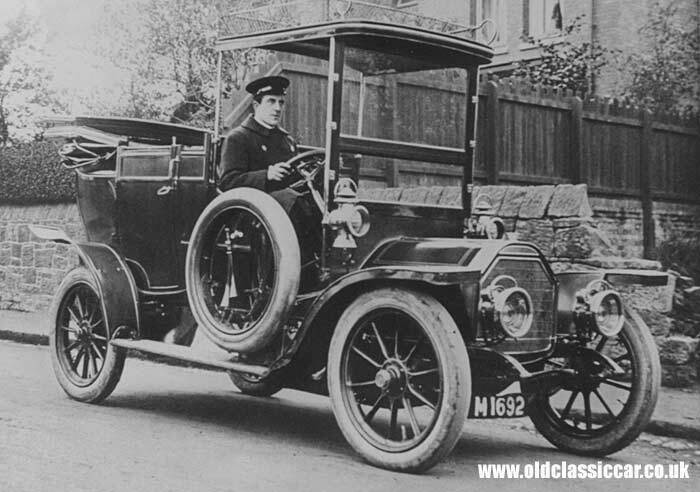 The vintage and veteran car pictures seem to cause the most problems when it comes to identifying older automobiles!! thanks to everyone who has helped with identifying the cars on this page, including Leif, Manuel, Kevin (Singer photos), John R, Nina, and Jim (re the numberplates shown). Click here to jump to the latest car photos added to this page. Photos of cars & other vehicles received so far! A change to this section! 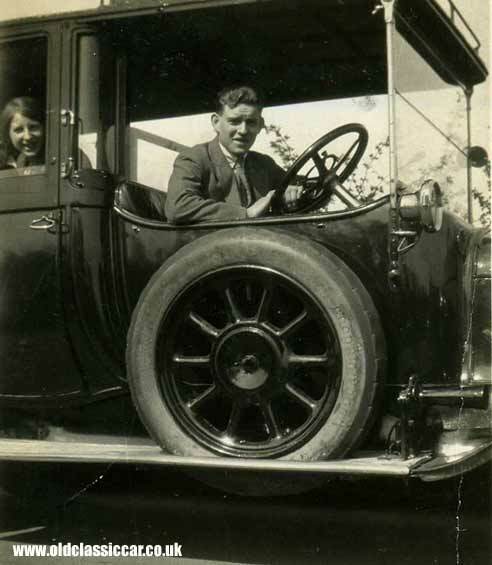 As vehicles in the photos are identified, they will be moved over onto the newly-created identified cars page, to keep this page focused solely on those cars, vans and lorries whose identity a question mark still hangs over. This will also explain why the numbering is no longer 100% consecutive! 9. This is one of a small set of photos I found a while ago. 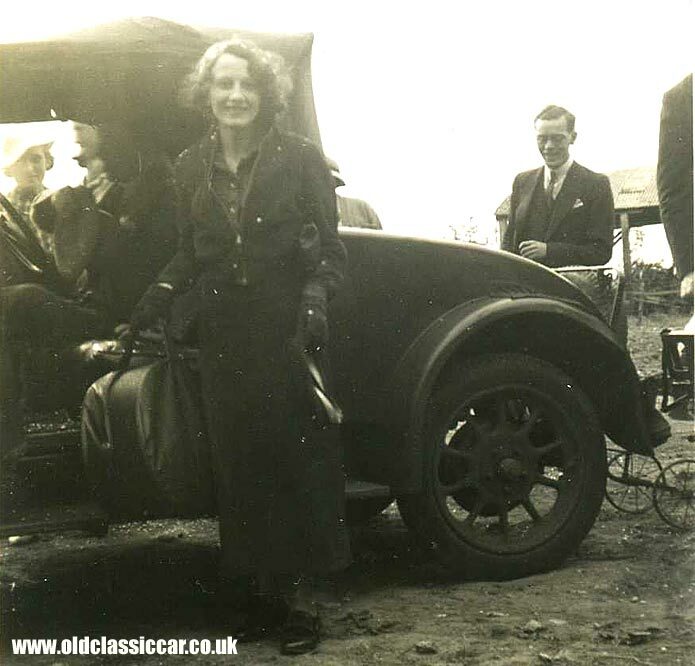 Parked on the left is an unidentified lorry, owned by Ever Ready batteries by the look of it, with a 1930s car - Austin? - parked behind. What I really like about this little photo is the drinking fountain on the right. It says 'Metropolitan Drinking Fountain', 'Cattle Trough Association'. Bet that isn't still there today! 11. This amazing image was taken in 1933, the rear having some notes inscribed on it. However none of the vehicles is identified. This, apparently, shows the quayside at Ceuta, taken from the deck of the S.S. Montcalur (or is it Montcalun? ), on the 22nd May, 1933. The handwriting on the rear suggests the taker lived in a house called Neepawa (a town in Manitoba, Canada...), in Great Missenden in Bucks. 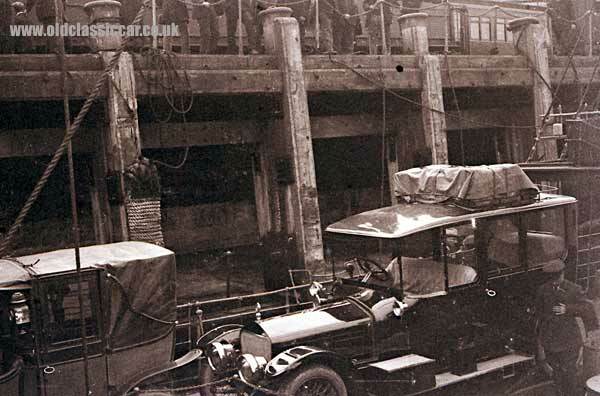 Various cars are shown here, as is a large charabanc further down the quay, complete with 2 spare tyres strapped on the back. 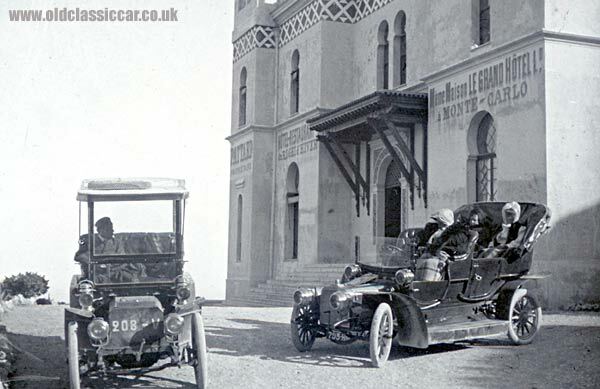 The open top motorcar nearest the camera looks like it could have been used by someone important, judging by the flag atop the grille, and also the visibile presence of official looking uniformed gents - police? Lloyd has had a look at this image, he suggests the vessel is the SS Montcalm, belonging to the Canadian Pacific Steamship Company, of Liverpool, and that Ceuta is "the main port of the bit of Spain East of Morocco, and south of Gibraltar - yes, Africa. The two cars nearest the bottom left hand corner look like Hispano-Suizas to my untrained eye". 13. Andrew sent in this old photograph back in 2004. 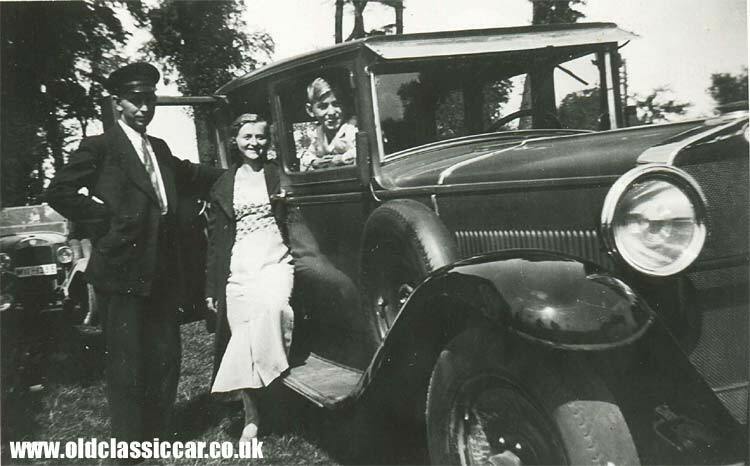 Its shows a car that belonged to the grandfather of a friend, who used to run a wedding car hire business back in the 40's and 50's. The big questions are - what model of Daimler or Lanchester is it, and approximate year of manufacture? sometime in the 1930s I'd estimate, but can anyone be more precise? It's a long shot, but does this car, registration is MN 7968 or WN 7968, still exist? Of course if the car does still exist, the number plate grabbers may have got hold of it, in which case tracking it down, other than via DVLA records, is all the more difficult as it would have a different reg. no. now. 16. 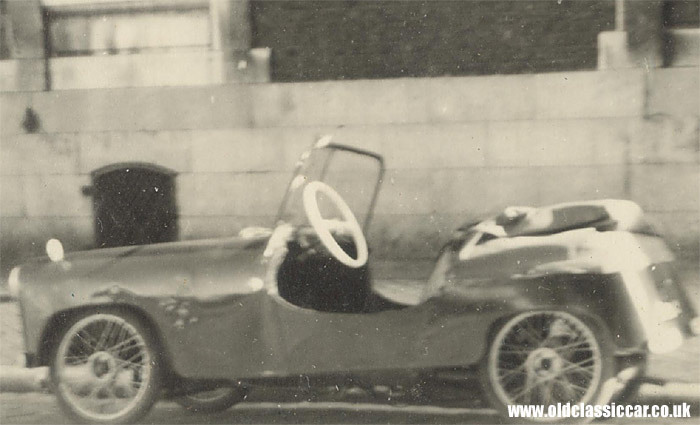 Bill, from New Zealand, sent me a copy of this photo that shows his grandfather with a very striking looking roadster, but the question, as always, is "what is this car?". 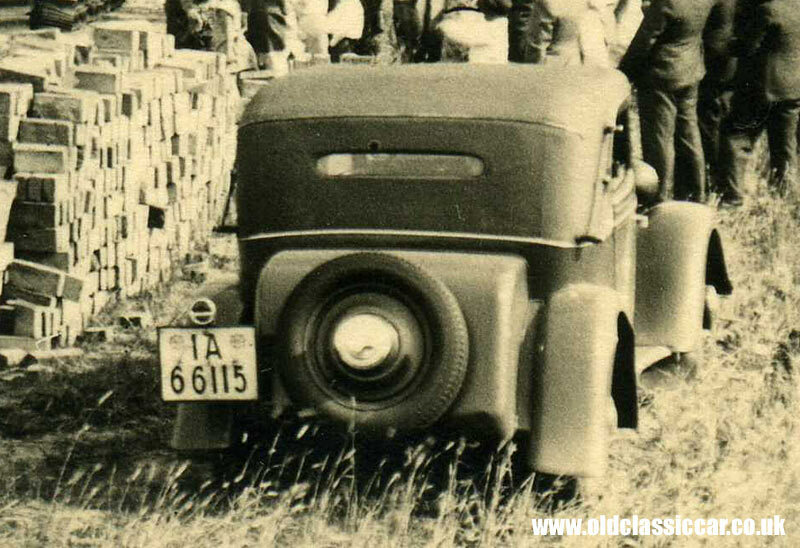 The grille is certainly very distinctive and should make identifying it fairly straightforward once a photograph of a similar car is located. He was posted to San Francisco in the early 1900s, but the Antique American Car Association believe that this is probably a car of European manufacture...A few suggestions have been made so far for this one - Spyker, and Métallurgique, with Bob coming up with this suggestion: "may I add as a suggestion, the German Szawe [if you have any pics, perhaps you can compare] .... Teutonic radiator, bespoke coachwork and disc wheels allude." 17. The photos shown here were picked up on ebay recently. Written in ink on the back of this pic is Barmouth, 1931, perhaps a shot taken on a holiday? 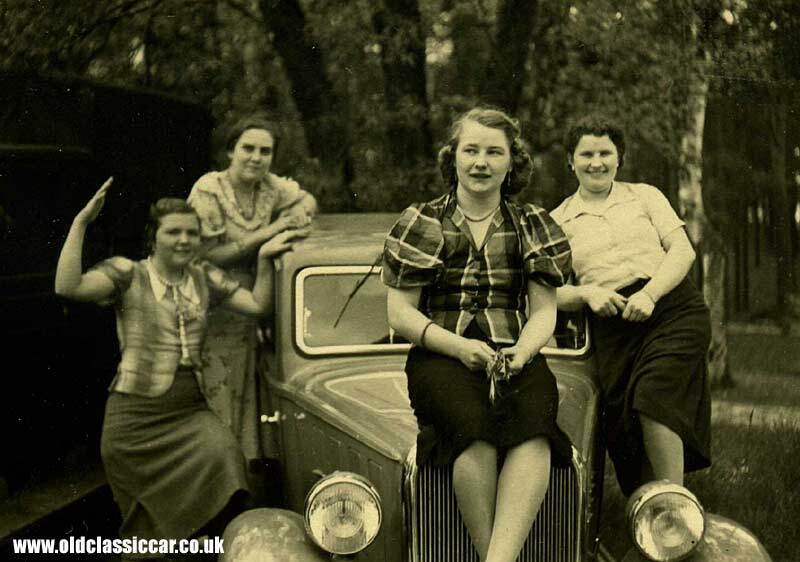 The car reminds me of a Morris - but I'm told it is probably a Standard - can anyone id this car for definite? 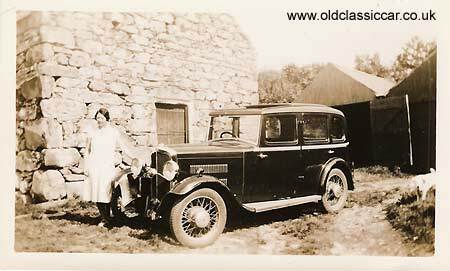 Alongside the car is a young lady, and behind a stone built cottage with wooden garages nestling in the background. 22. 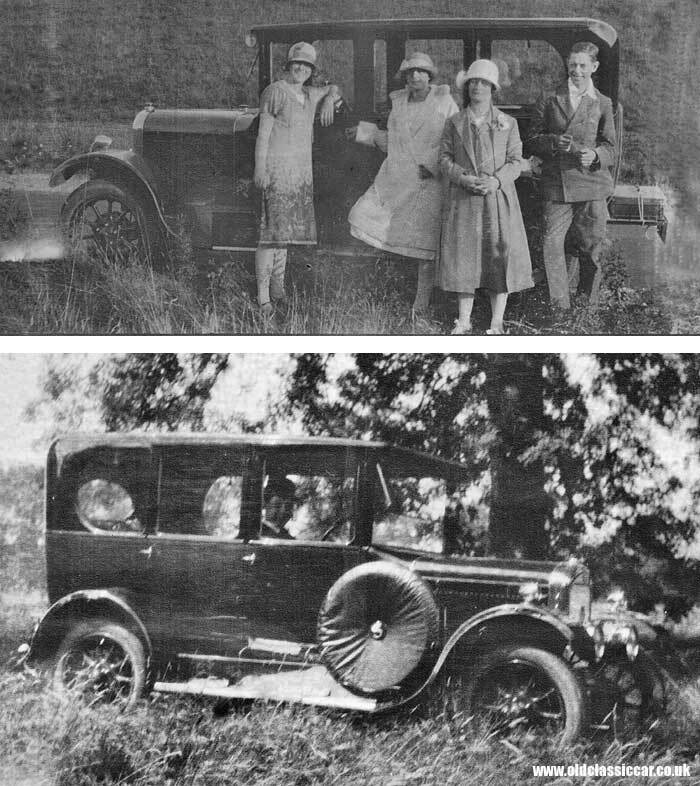 The charabanc, De Dion Bouton and motor/bicycle photographs shown below come from John Palmer's website about Wirksworth and the surrounding areas. Thanks John for ok'ing their use on my site too. If anyone can shed any more light on the vehicles shown here, please get in touch and I'll forward the information on. 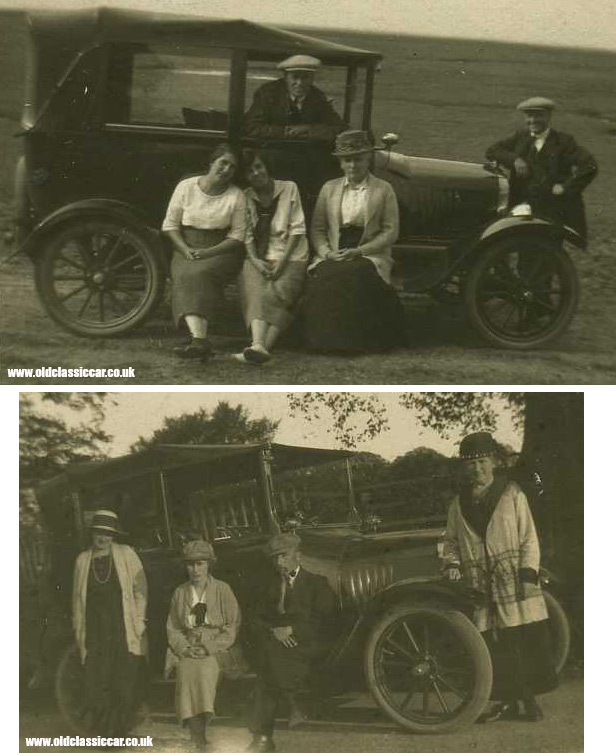 Both charabanc photographs shown were taken in the Matlock Bath area, probably around the early-mid 1920s. 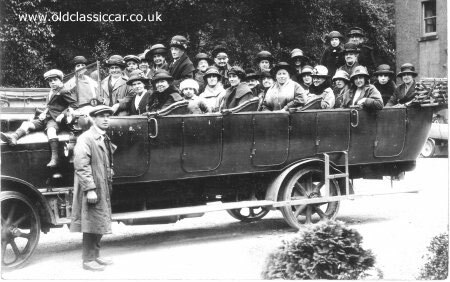 The open top bus shown here is certainly very well loaded, note the child perched on the bonnet, and solid rubber tyres fitted to this particular charabanc. 25. 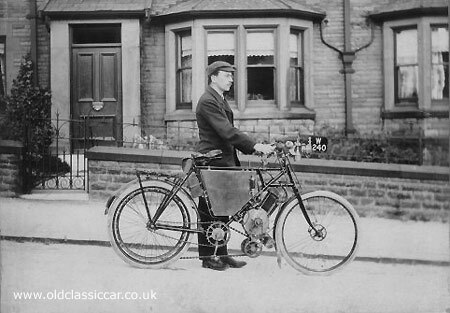 The motorised cycle shown in this photograph belonged to a chap living in Buxton, Derbyshire, and pre-dates the more common layout of motorcycles in later years. Interesting things to note here include the convoluted chain layout and minimal provision for braking. Can anyone tell us what make of powered cycle we're looking at here? Mark thinks it could be a very early Matchless motorcycle - correct? 26. 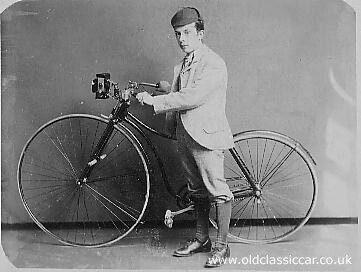 A very interesting, and well-specified, bicycle was the subject of this photograph taken way way back in 1895 no less. Spec includes solid tyres, acetylene lamp up front, pneumatic back tyre scraper, racey drop handlebars, no mudguards and a tool roll strapped to the underside of the crossbar. 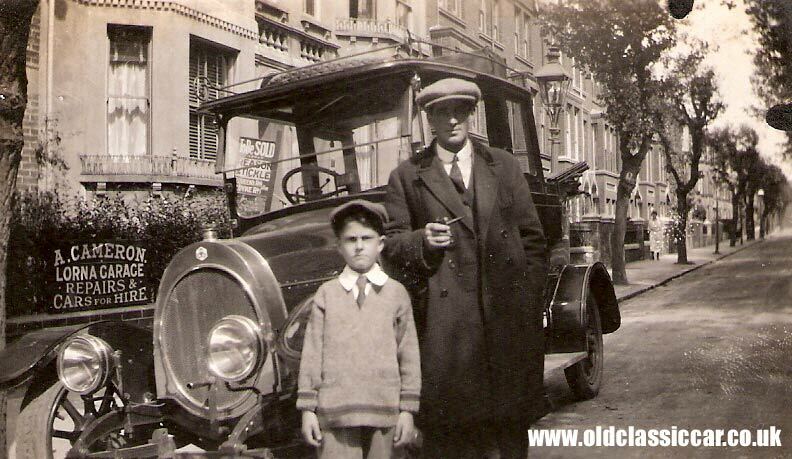 The chap in the photo is Walter Doxey, from Matlock in Derbyshire. The story of Walter, and one of his rides on this interesting machine, can be read on John's site on which the pic was originally published. 27. 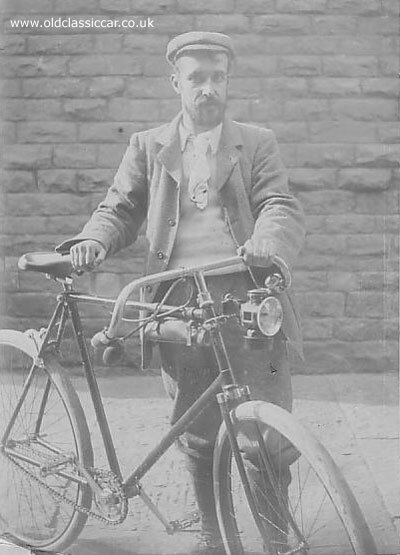 Brother of Walter above, was Alfred DOXEY, seen here with a very old pushbike a few years earlier, in 1889. I'd be very interested to find out what make of bicycle Alfred is holding on to here - the front wheel is larger diameter than the rear, and foot rests are fitted to the front down tubes to the front wheel. 28. 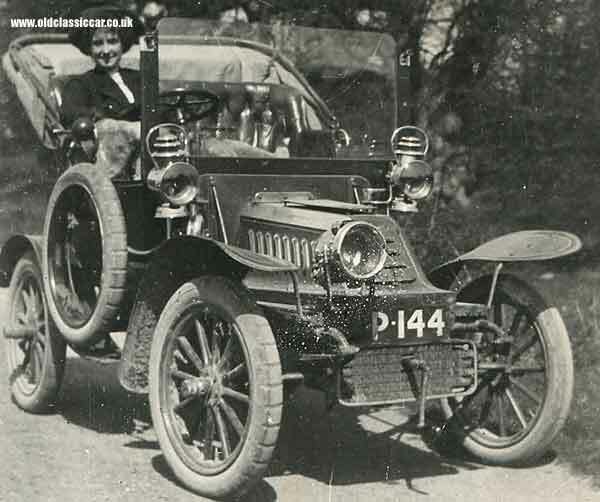 Claire Godfrey contacted me at the end of 2005, with this photograph showing a touring car early in the 20th century .... "I wonder if you can help identify the car in the attached photo? It belonged to my grandmother's father and she is keen to identify it. We believe the photo was taken in about 1906 - but it could be a few years either side. Any information you have would be of interest." Mark in NZ got in touch, he thinks it could be a 1914 Unic. 32. Eoin dropped me a line, with a copy of this photograph, asking for some clarification on what it might be. 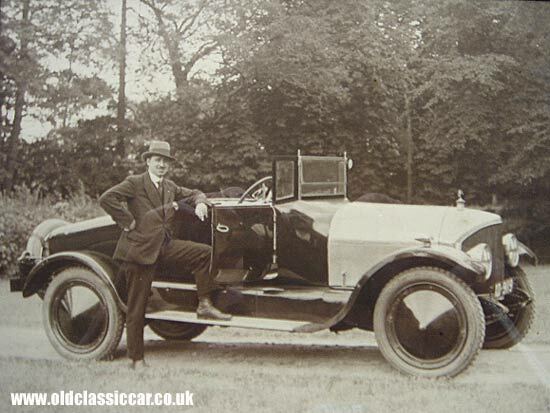 He wonders if it is a Chenard et Walcker, from the very start of the 20th century. 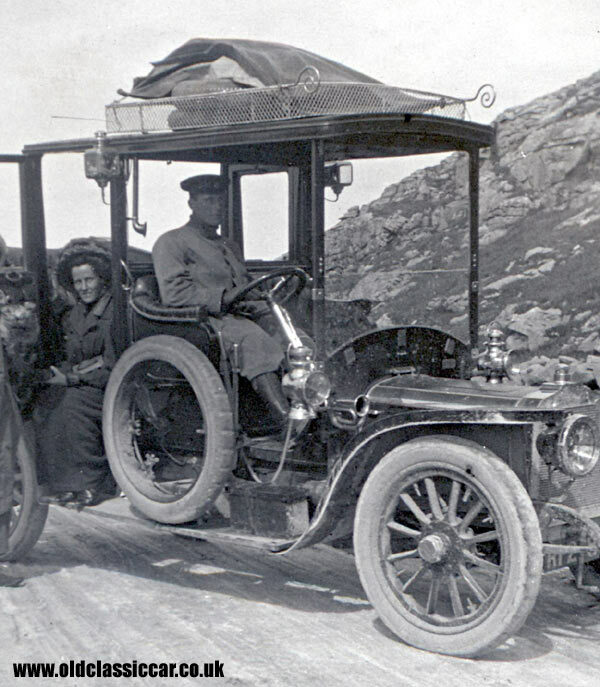 However attached to the scan was a note, reproduced from some words written on the back of the photo, advising that it may actually be a Panhard et Levassor from 1898, 6hp tonneau, rear entry. I am the first to admit that I don't know much about veteran cars. A quick look online brought up this website, featuring cars that are eligible for the London to Brighton run. 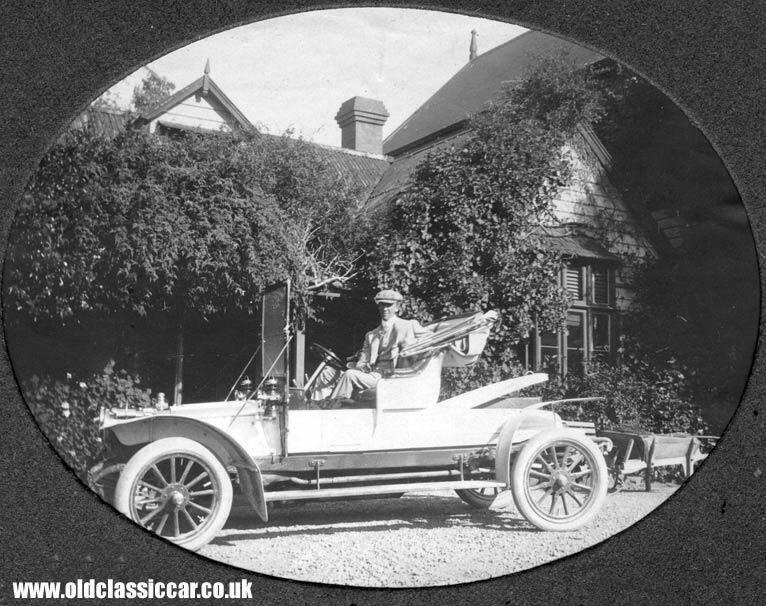 There are pictures of several Panhard Levassors on this page, and I think that it confirms the identification of the car shown here, although the length of the bonnet suggests it may be a 1904 model, rather than 1898. All advice from veteran car enthusiasts welcome - is A0 138 still around? Update - Eoin advises that the wheel hubs actually read Chenard et Walcker - so the plot thickens - can anyone positively id this car for us?? 33. 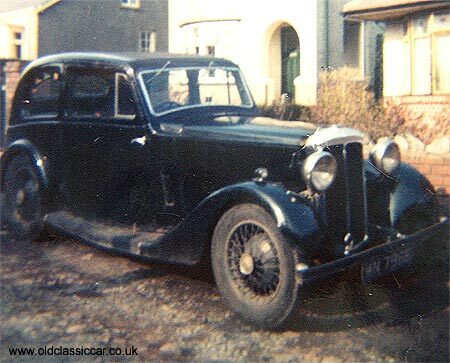 Some photos sent in by David K of vehicles requiring identification :- he has been rooting through his loft and turning up some great photos, four of which are featured here (the others are in the period motoring photographs section). 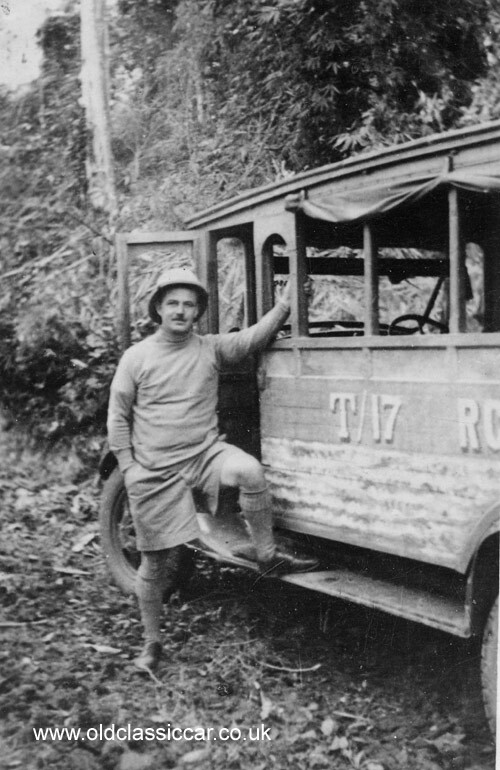 The first picture shows David's Grandpa out in Burma in 1941, with a very interesting old Burma bus alongside. 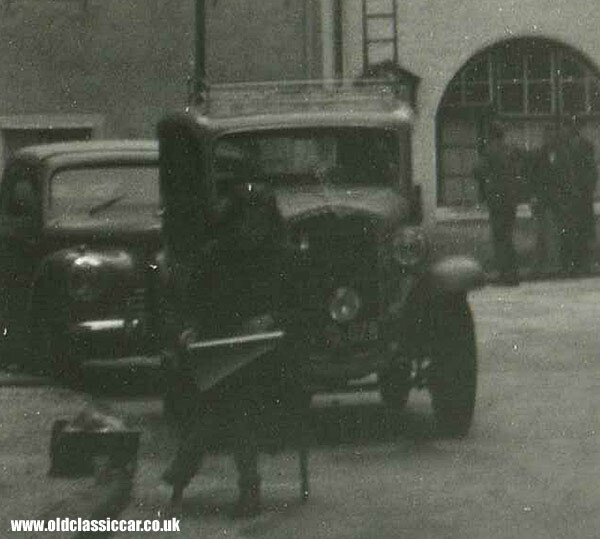 The origins of the chassis and coachwork will probably remain a mystery, unless anyone can identify this locally-bodied machine? 34. 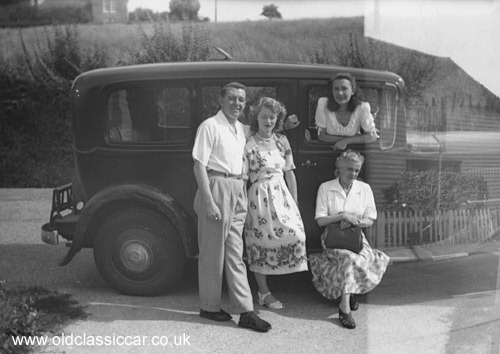 A view of family members in the 1950s or 1960s, but what car is that they are shown with? its obviously a large imposing machine, and was probably a pricey motor judging by its sheer presence, and the wheel discs that were often found on quality motors. Marks adds: "The hubcaps on number 34 have a very Packard look about them - 1932 standard eight I would say". 37. I assume this photo was taken at a British seaside in the 1950s. The vehicles in the background are as interesting as the bumper cars closer to the photographer. It would seem that there is a race due to start, between these bumper/dodgem cars. Some of the cars have 2 men crews, whilst others have the advantage of just one person on board. Each dodgem car has sizeable bumpers front and back, and are finished in a variety of colours, loosely styled on the front engined single seat racers of the era. I assume they would have been powered by small 2 stroke engines? does anyone remember these cars, or have a clue as to where this photo was taken? 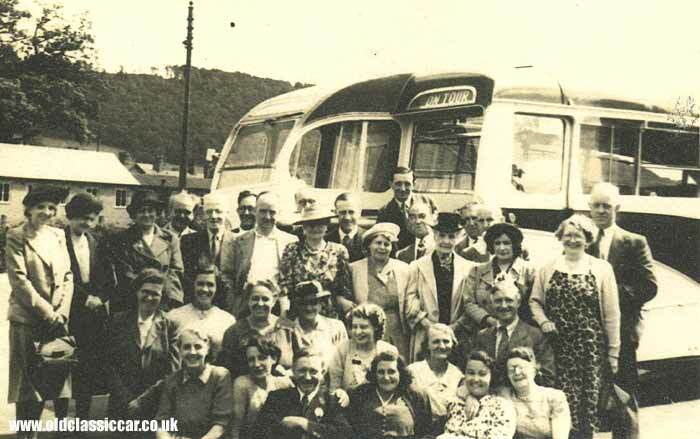 In the background are lots of period coaches, with Duple body Bedford OB examples being plentiful. Update. Rob got in touch early in 2008: "just a short note about your old pics. No.37 is an old fairground ride that would only let adults ride, possibly because it was so dangerous. They were petrol driven & very noisy & smokey. I remember them at Southend or Margate." 40. 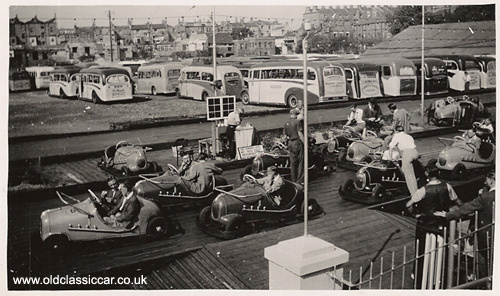 Popular at seasides and other venues were mockup cars, in which people could sit and have their photo taken. A background image would have been painted onto a screen or wall behind the 'car', to give some realism to the photo. 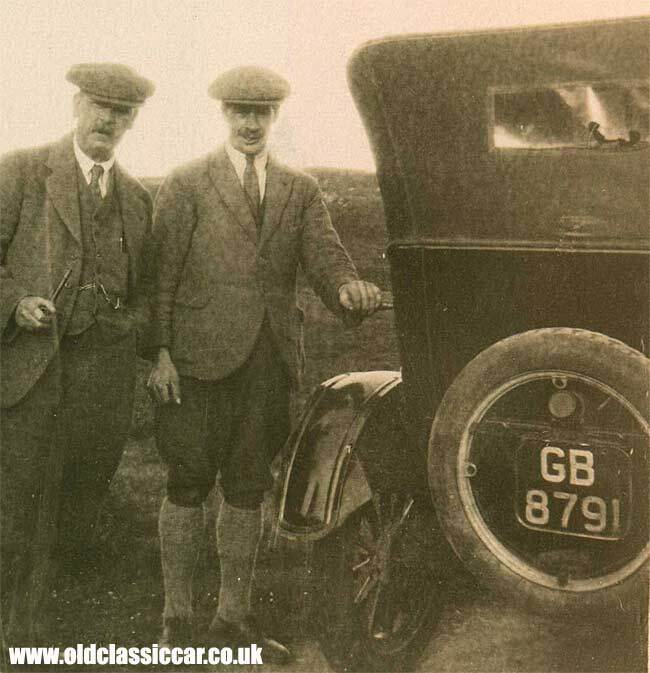 The picture here is a classic example, and shows a couple of lads sitting proudly in what looks like a 1920s tourer. A painted street scene can be seen behind. This particular photo has been printed onto a postcard, but there are no clues as to where the photo was taken sadly. 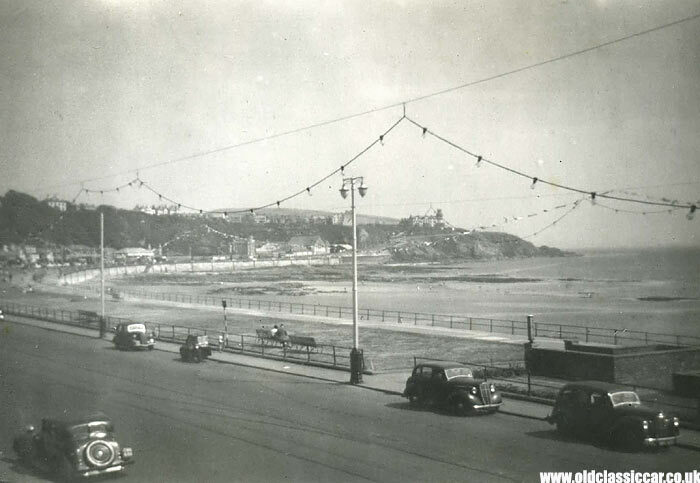 A similar seaside image can also be found here, in the main vintage photo section. 41. 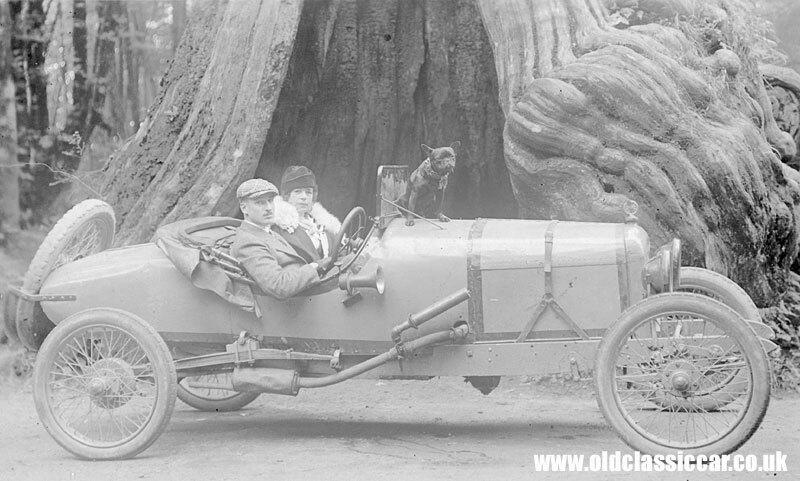 Quite a lot more recent but again with no information, is this picture, showing a dragster with its driver on board. Power seems to come from a straight six Jaguar XK engine, with open exhausts (it must sound great). Anyone know more about this car? 42. Firstly, thanks to David who kindly sent me over scans of the following nine photos. Amazingly, these, and other pics, were discovered in a loft! 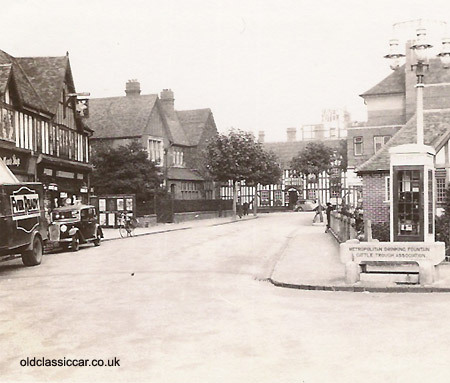 .... "When I moved to Farnborough about twenty five years ago, we found in the loft about three hundred old photographs dating from the early 1900s, including nine which feature vintage cars. I wonder if you would be able to identify them for me, please. I attach the images of the photographs. It is possible that some of them are the wrong way round. They were on glass slides and I'm uncertain in many cases which side they should be viewed from. ". 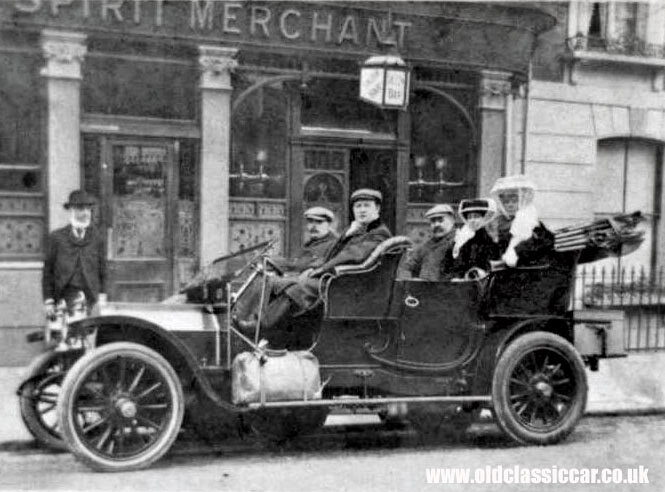 So folks, can anyone provide identification on any of the very early motorcars shown on this page?? please get in touch via the homepage, if you can offer suggested makes/models of the cars shown, thanks. 43. 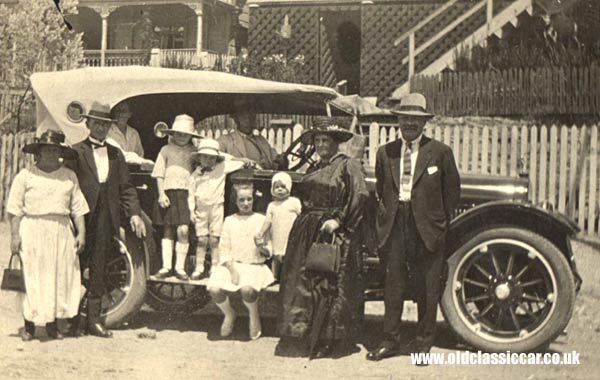 Both photographs below show this cosmopolitan family leaving their hotel, very early in the 20th century. I wonder what this building looks like now? the furthest piece of signwriting on the building advises us that "Pattard" was the "proprietaire" of this particular Hotel-Restaurant. Nearest the camera, the writing says "Meme Maison Le Grand Hotel a Monte-Carlo" - which my rusty memory of the French language suggests that this hotel was under the same ownership as Le Grand Hotel in Monte-Carlo, as opposed to it actually being said establishment. Mark thinks the car reg 208V is a Peugeot and the tourer might be a Brasier. 44. 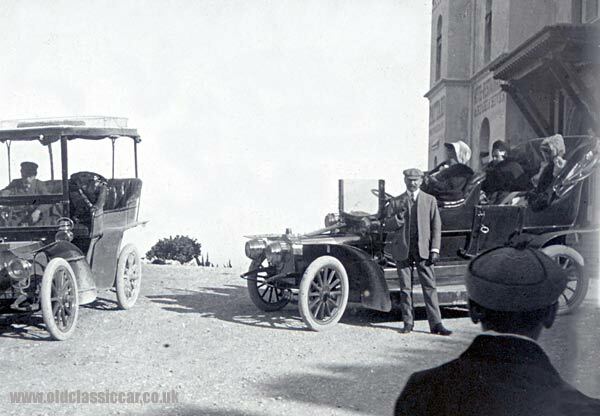 A second photograph showing the cars with passengers on-board and ready for a road trip. 46. Both photographs below a different car, caught in two different situations. The first picture shows it (and the car shown in the first pic at the top of this page) loaded on a ship, presumably setting off on another continental trip. Note all the men at the top of this photograph - dockers perhaps? - stood alongside the quayside. 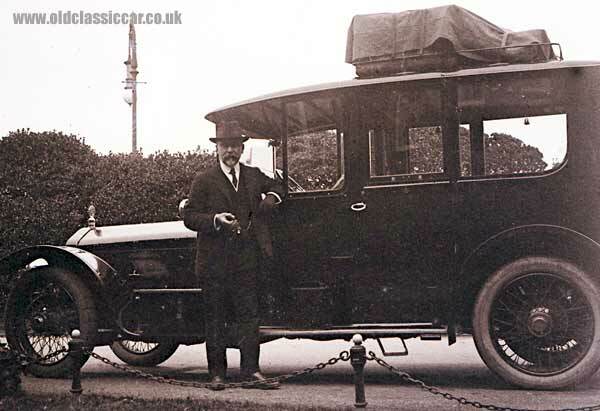 Marks thinks it could well be one of the bigger Wolseley-Siddeleys from about 1912. 47. 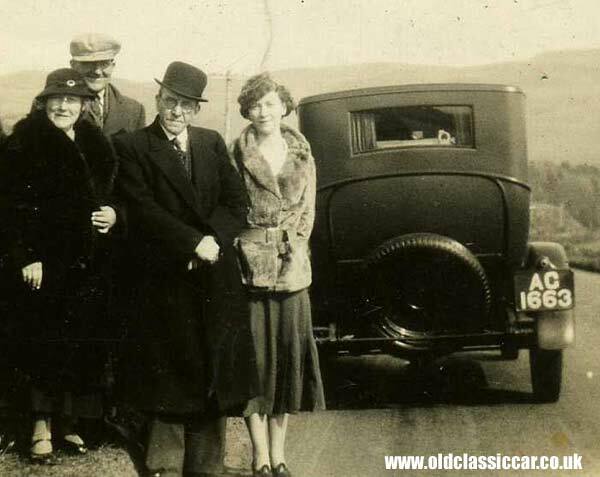 The second photo shows the same car with a smartly dressed gent who appears in a few of these photographs in this fascinating collection. 48. 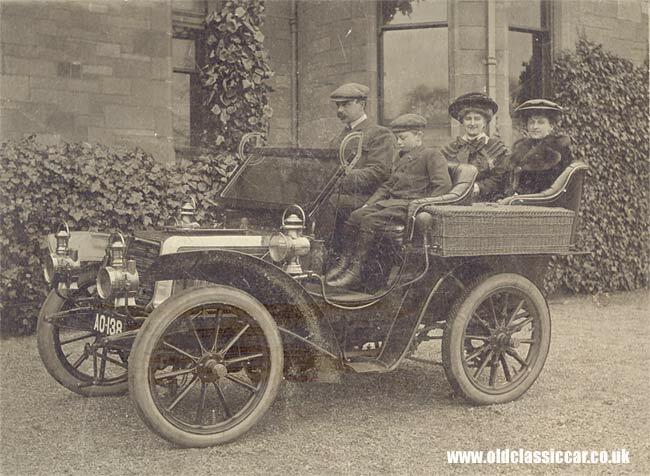 Next is a view of this family with another car designed for touring, note the volumous luggage rack mounted on the roof. 49. 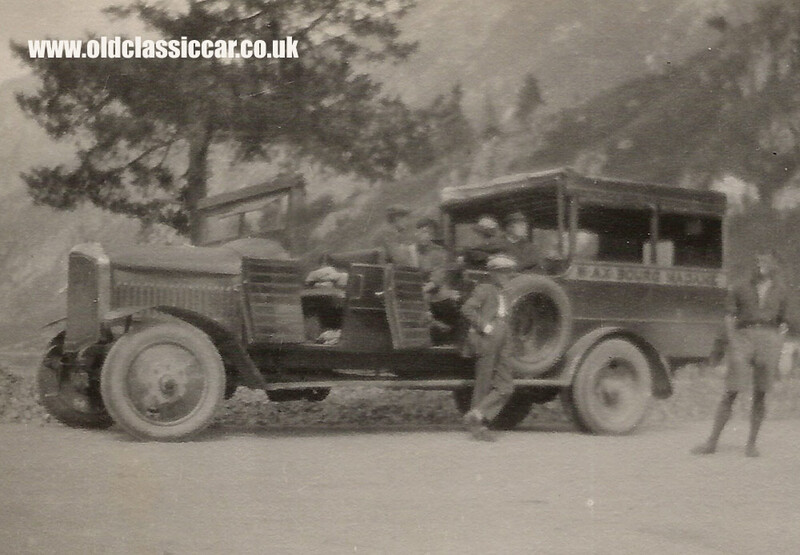 The final pair of photos show another touring car, loaded and ready for a journey (note the spare tyres on the roof under a sheet). I'm sure the shape of the radiator, and distinctive curved scuttle, will aid this vehicle's identification. Dane thinks it could be a Talbot. 50. Thanks again David for sending all these rare images over. Dane thinks it could also be a Talbot. 60. 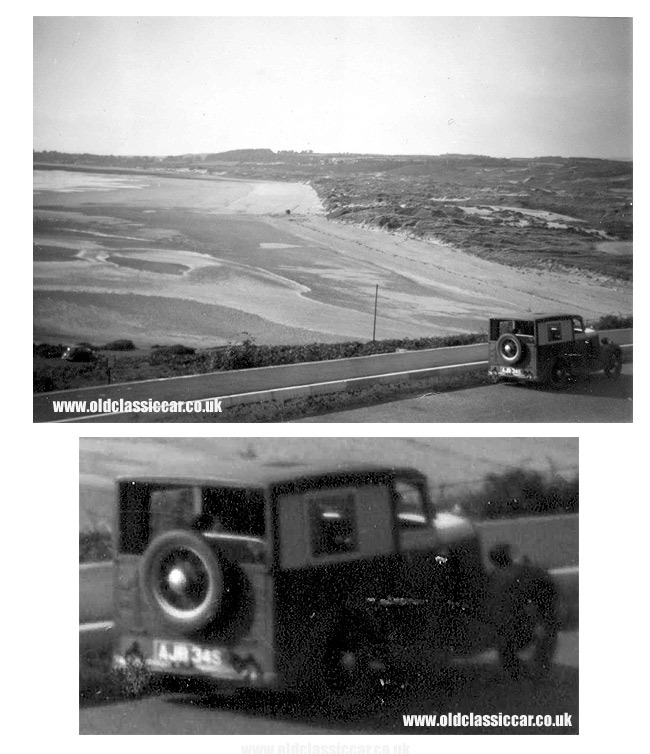 George sent in this picture from his family photo album, showing an unusual shooting brake / woodie estate car, parked near a Welsh beach in 1952. 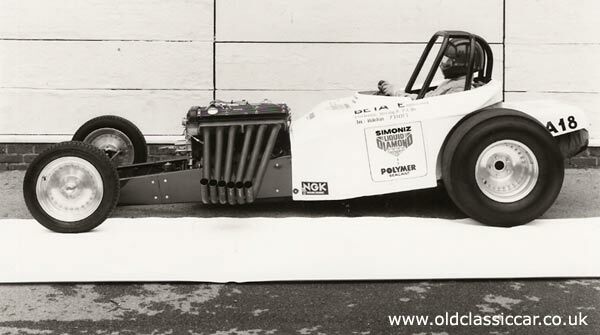 It looks homebuilt, but on what chassis & running gear?? Another photo from George shows the woodie parked on a large seaside camp site. Nina suggests it might be Model Y Ford based? 65. 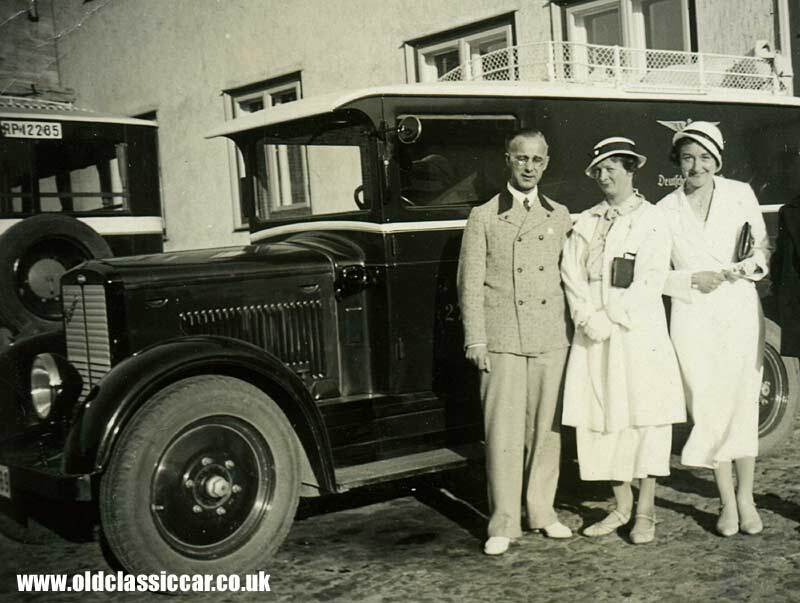 Another upmarket looking car, this time from the early 1920s at the latest I suspect. This one appears to have broken down, judging by the ample (open) toolbox that is sat on the running board. 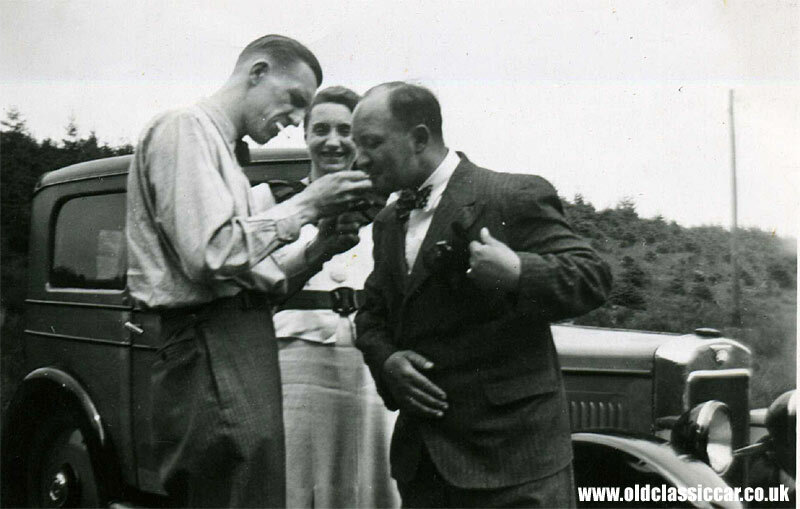 The chap with the pipe looks like the owner, perhaps the guy in the floppy hat is the man-servant? who knows. The shape of the wing and running board, and the height of the vehicle, suggests a very early car. 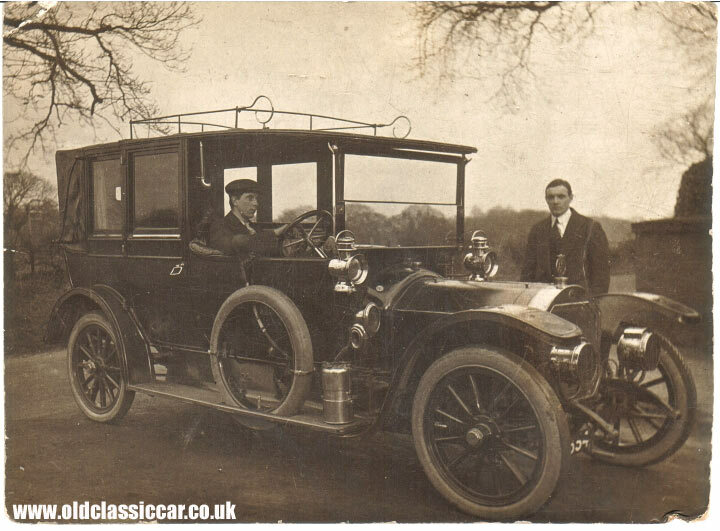 One idea that has come in is that this car is a Lanchester, from c1913ish? 67. David, who lives in Sweden, forward this photograph over, enquiring as to what make of lorry is shown here. The towtruck was photographed in Norway, but no other information is known about it. Can anyone advise? it doesn't remind me of any UK trucks, but many chassis were fitted with coachbuilt bodywork. The shape of the cab and doors suggests to me a continental manufacturer, or is it American as Nina has suggested?. Anyone know?? Jim, on the numberplate: "Definitely NORWAY, F = Buskerud, but the dates ran from 1913-1971 so not much chance of working out a date there." 68. 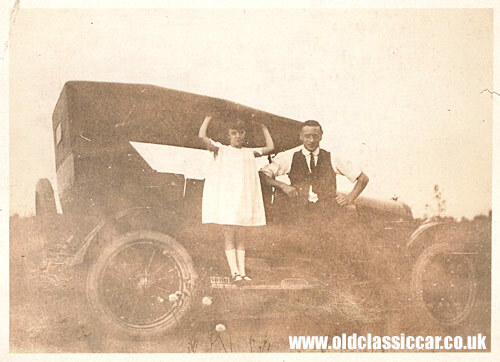 Taken with a very basic camera by the looks of it, showing a dad with (presumably) his daughter, in front of an old convertible touring car of some kind. Sadly there isn't much detail in this picture. It looks American to me, note the elaborate metal footsteps on the running board. The photograph is dated September 6th 1925. Mark adds: ".. could be a Briscoe from around 1920. A distinctive feature of these was the sharp edge on the back of the tourer body. I recently did an article about one of these for the NZVCC magazine Beaded Wheels. The other feature were the hubcaps in the shape of a large crown". 75. 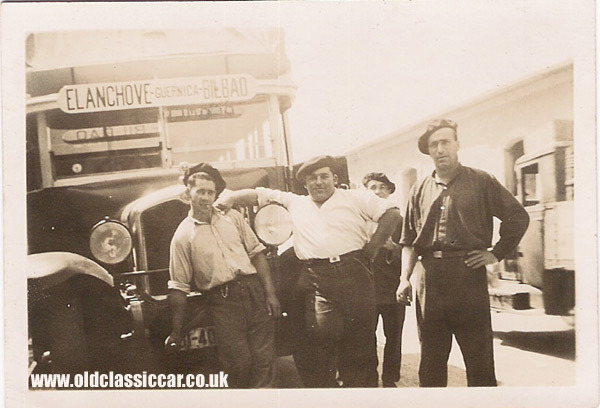 Another Spanish photo, this time showing a lovely old chrome rad bus - the destination board says "Elanchove - Guernica - Bilbao". Not sure who the four gents are, perhaps mechanics? alongside is a dropside lorry. The fella on the left is propping himself up on the starting handle. 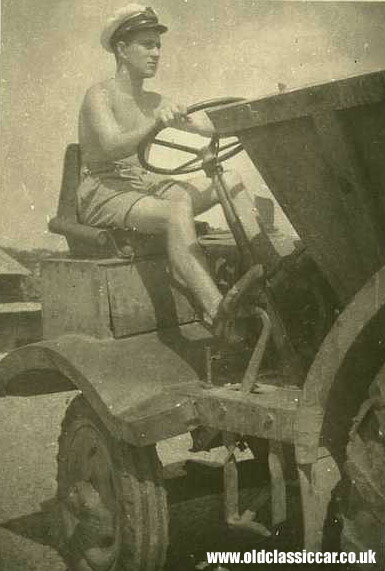 A note on the back advises that the picture was taken in San Sebastian, Julio 1933. I'm told that Elanchove is now shown as Elantxobe on Google Earth, on the coast NE of Bilbao. 78. 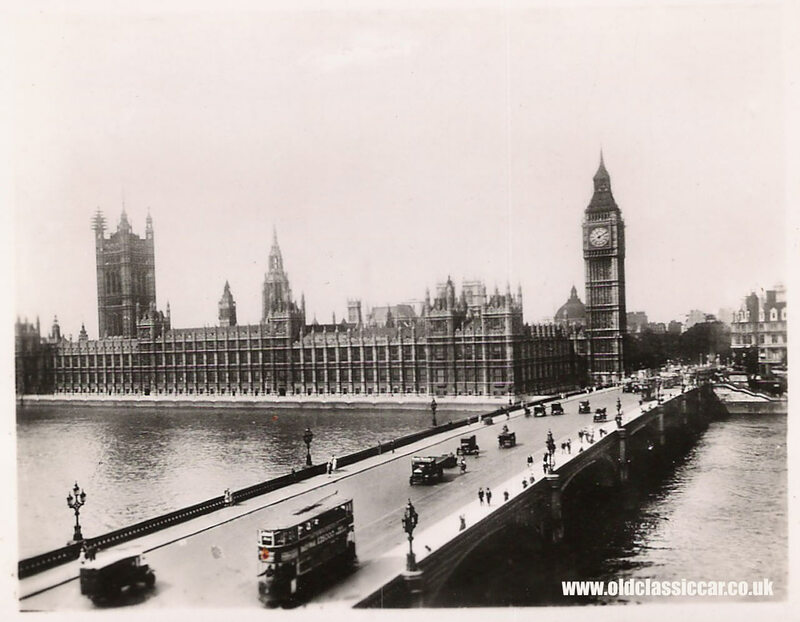 Ok, not much chance of identifying any vehicles in this olde view of Westminster Bridge, London, but its an atmospheric picture so I included it. I'd guesstimate the photo to be from the 1920s. Click the thumbnail to see a (146k) larger version. Several different vans can be seen crossing the bridge, along with a tram, with a centre (under ground) contact. Lloyd adds: "Notice the pole on the roof, but no wires - in the city they drew power from underground cables via a 'plough' that hung from the tram through a slot in the road and rubbed the cable there. Safer than it sounds!". On the side all I can make out is the sum £25000, perhaps a draw of some kind? Cyclists, pedestrians and even a horse-drawn wagon can be seen in this lovely old pic. Despite Hitler's best efforts, this scene (broadly) exists to this day. 79. Real oddball here!? click for a larger view of this chara-banc type vehicle. No information is given, I assume its somewhere in the British Empire. The vehicle is a huge affair, with what is probably a locally-built chara body fitted. I can't quite make out the writing on the side - something like 'AX BOURG MACANE' or something similar??!?! 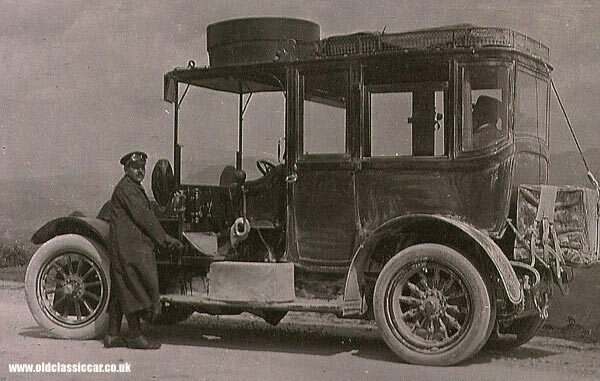 perhaps the operator of this bus/charabanc. The fella on the right wearing shorts is puffing on a cigarette, with most of the others still sat in the vehicle. I wonder what truck or bus chassis this is? the front end styling is quite distinctive. I'd guess this photograph was taken during a break on a long-ish journey. I'm told the writing reads: Bourg-Madame. 96. I suspect this picture was taken somewhere in Europe, probably in the 20s or 30s. The car looks like a 2 seater, with either solid wheels, or full width trims. Is that two spare rims on the back? There is a large GB (Great Britain) plate on the back too. Surely someone recognises the location, a square, with a horse and rider statue. 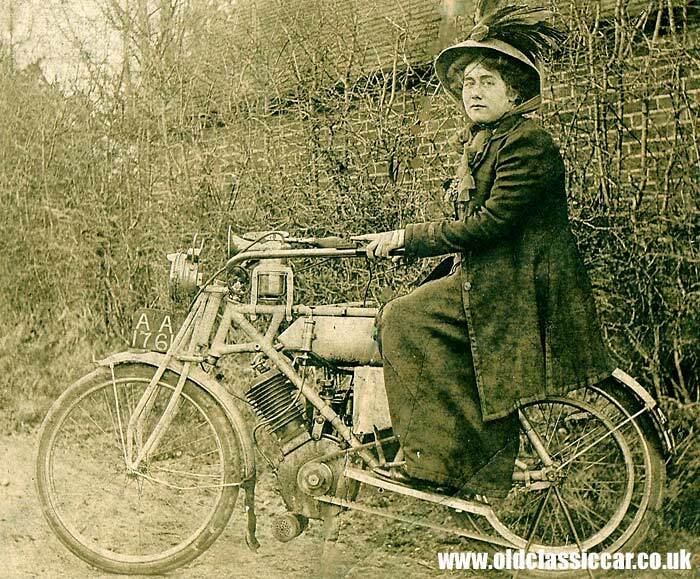 Roger thinks it could be a BSA V Twin of c.1922. 97. The large saloon, or 'sedan', seen here came with a batch of photos I bought from the USA. 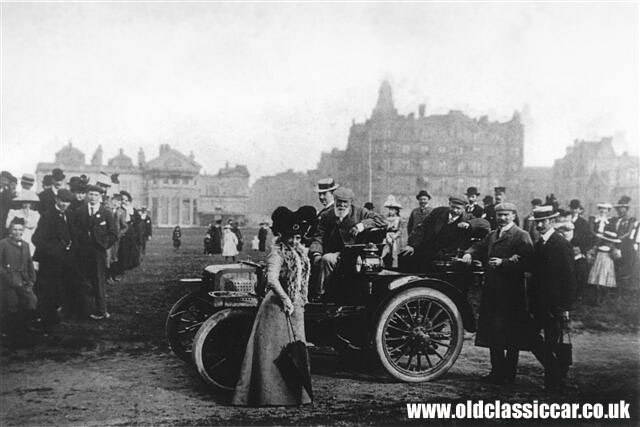 I don't know what car this is, but it looks like an expensive one, seen here with an imposing looking lady alongside. Note the neat pinstriping on the car, and the blinds fitted to the rear passenger's windows. 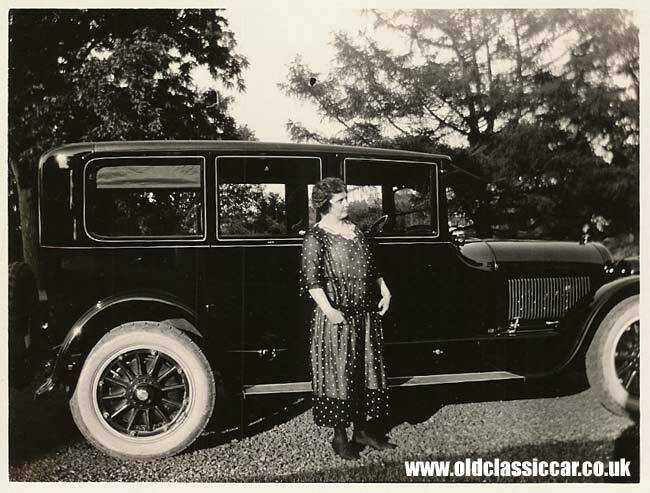 One suggestion is a 1924 Cadillac V63 suburban. 113. 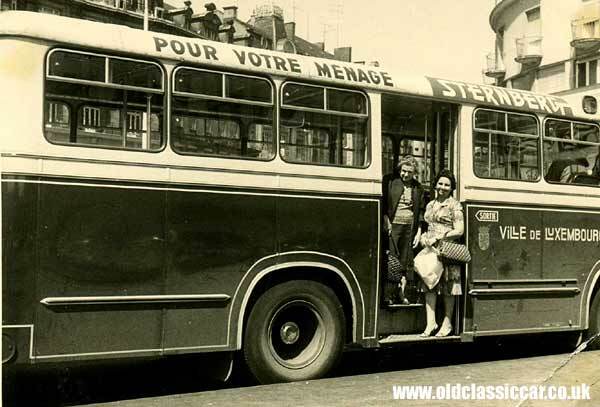 Side view of a bus or coach in 1950s Luxembourg, serving the 'Ville de Luxembourg', and advertising Sternberg, 'pour votre menage'. 114. Rear view of a car, seen in 1931 or 1932, with distinctive beading to the rear body. Registration number is AC 1663. Anyone recognise this one? 118. 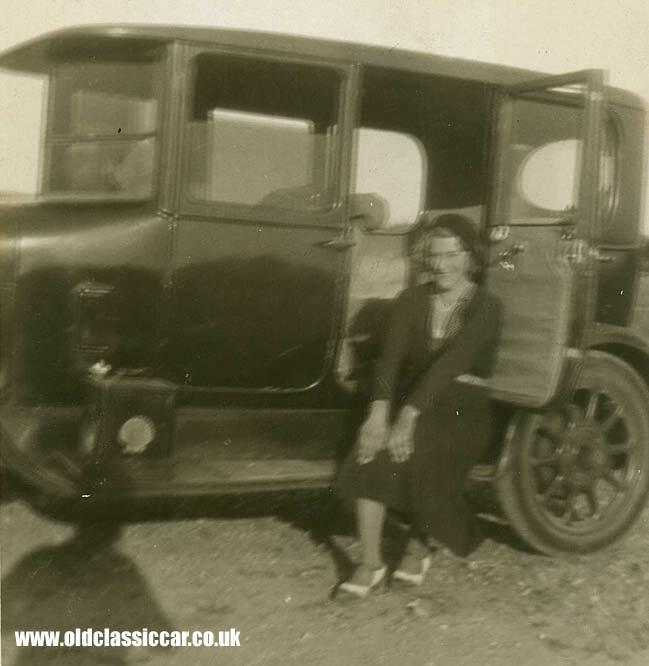 A slightly blurred photograph, showing a lady sat in the rear door opening of a 20s (or perhaps earlier) car. It is fitted with artillery-style wheels, and a Shell 2 gallon petrol can mounted on the running board. 119. 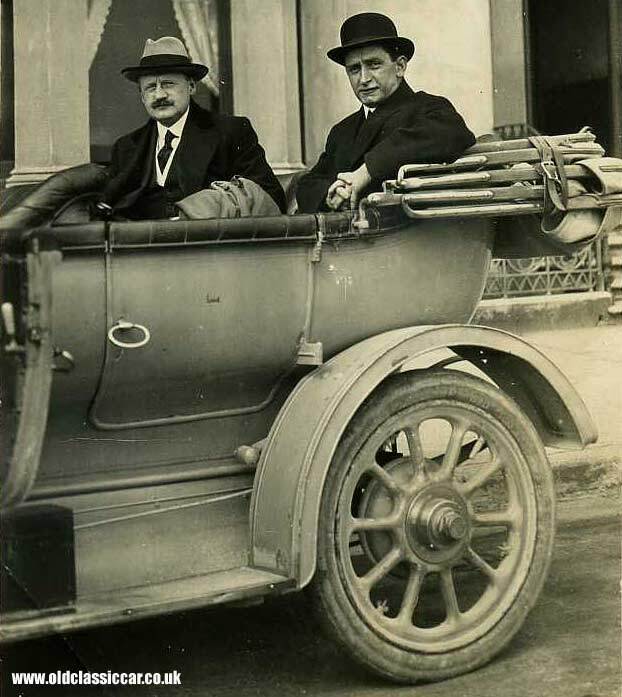 Two gents and a very fine motorcar, with AA badge mounted on the radiator. 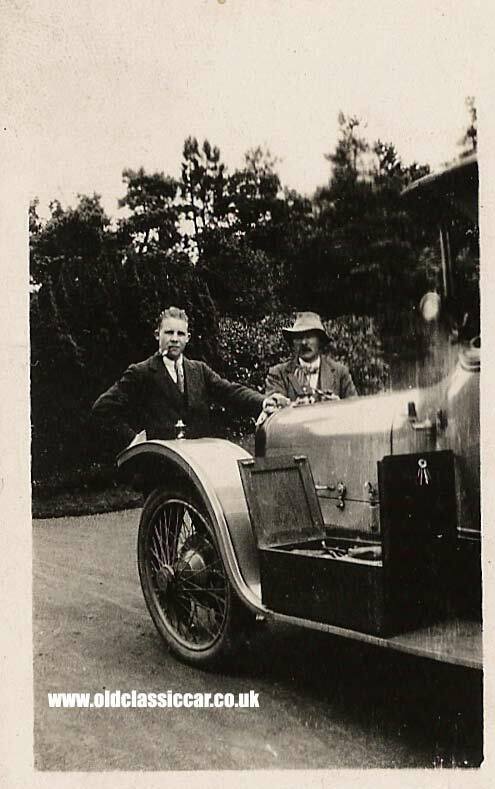 Gloria sent this photo in, and asks "The photo was taken around 1920 and shows my grandfather at the wheel of Lord Leverhulme's car. He was his chauffeur. I have been informed the badge on top of the radiator is an AA badge, and someone has suggested it may be a Sunbeam Talbot". Can anyone positively id this car? Dane adds: "Doubt if it is a Sunbeam, possibly a Napier, internal edge of radiator sheet brass is more angular in Napier, and curved in Sunbeam." 120. Here's another mystery. Peter sent this image over, wondering what the car might be? Mark (NZ): "note the car has a dip in the middle of the chassis. I think that is DeDion-Bouton but could be corrected on that.."
121. 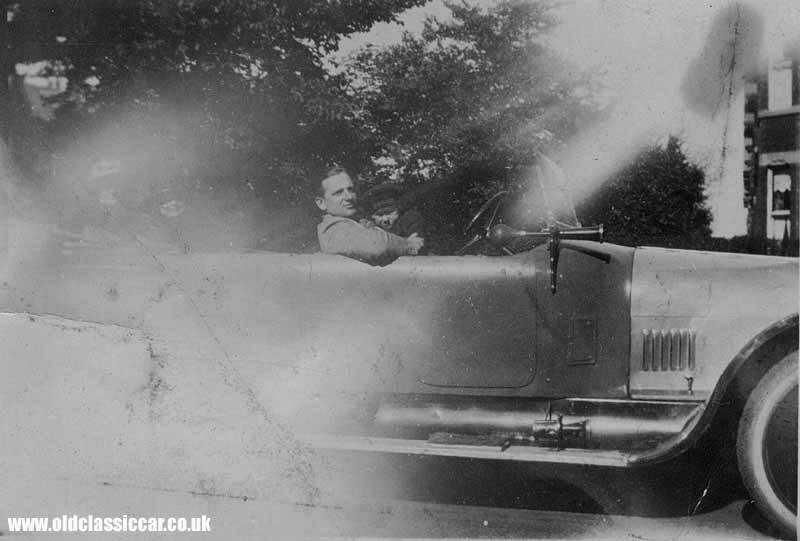 Andrew sent over this request for information: "Would be most grateful if you could identify the car make and type if possible. 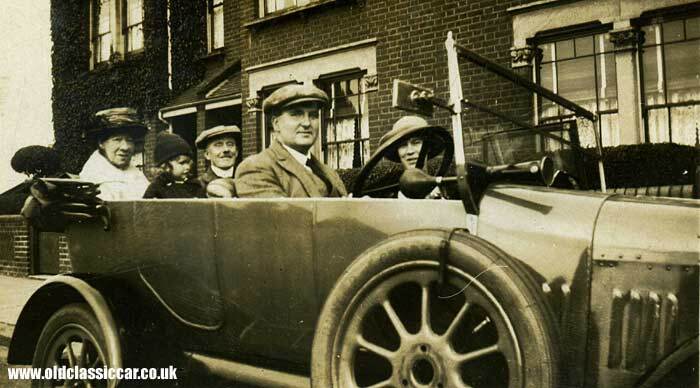 The man in the front passenger seat is the famous golfer Tom Morris." Dane suggests: "Could well be a Daimler. Bonnet and wheels are very Daimler, but cannot be certain." 122. 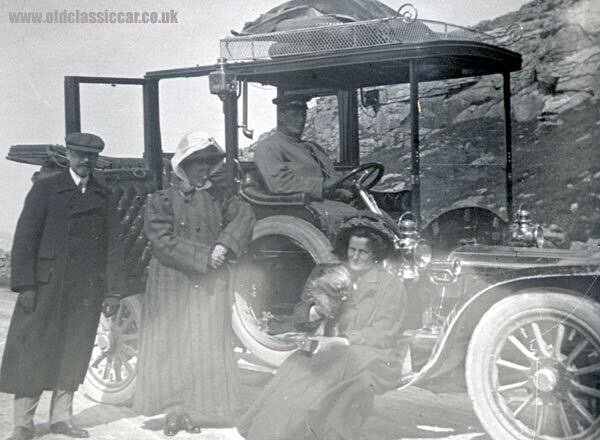 What a splendid way to visit the beach, but what are this couple sat in?? 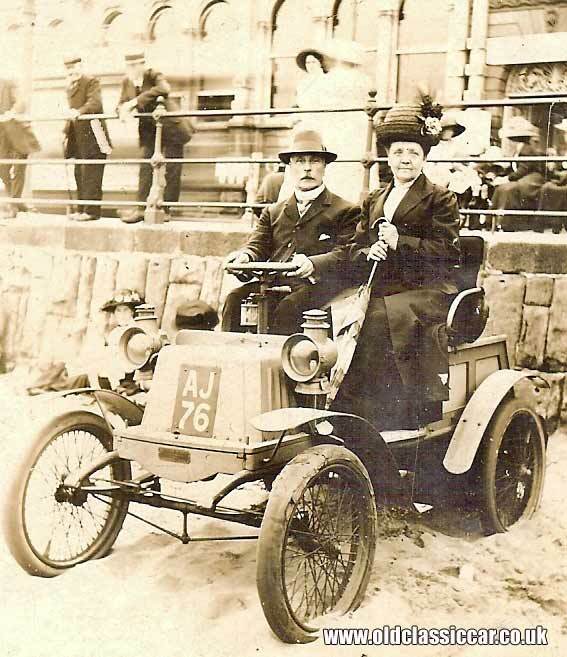 Tony sent it over: "... my great great grandparents on the beach in a vintage car (presumably not theirs). I would like to identify the make, model and year of the car. Can you help, please?" 130. 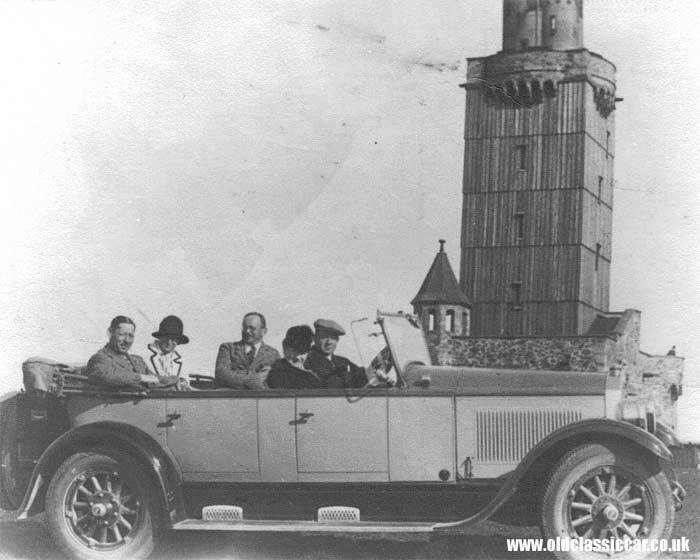 John R sent me this photograph, he recognises the make of car but is unsure of the location: "The attachment is a 1927 Buick, full of relatives of my friend's wife, Nicola, but we don't know where the photo was taken, probably central Europe, it might be interesting to know if anybody recognises the tower". Does anyone recognise this distinctive tower? 131. Fiona sent this photo over in 2008, asking if I could identify this car. It looks like a homebuilt creation to me. Her father ran it in 1958 around the Lewisham area, and kept it for a year or so. The wheels look very lightweight to me - does anyone recognise this car, or what chassis it may have been constructed on? 132. 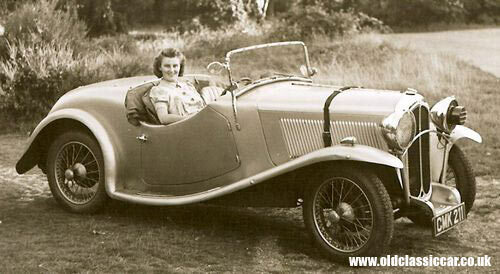 Ok, first of several mystery car photographs that were taken elsewhere in Europe, sometime during the 1930s. 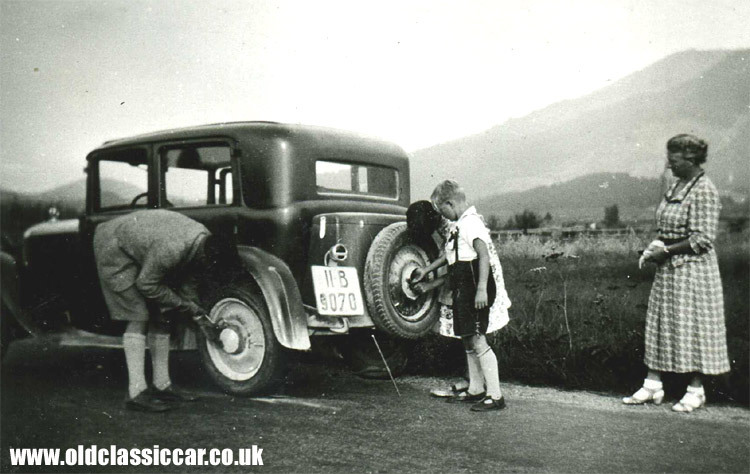 This image shows a chap changing the wheel on his car. Does anyone recognise the make, or perhaps the style of registration plate? there is a mascot visible on top of the rad, Mercedes perhaps? Syd in Melbourne adds these thoughts: "It represents a good Bavarian family, the date range is pretty right, the number plate is in the German 1906-1945 series, 11B 9070 is a BAYERN (Bavarian) issue, 11B is the code for Oberbayern, both father and son appear to wearing Lederhosen - leather short trousers common in Bavaria, the little girls looks to be wearing a very pretty and intricately detailed frock, also common to Bavaria. The bonnet mascot is probably a radiator temperature gauge, which were a common period accessory, small needle indicating engine temperature to the driver. Looking at the solid wheels probably dates the car late 20's to mid 30's, my guess - a guess only - would be an Opel. Hope that helps, look forward to hearing from you." 134. 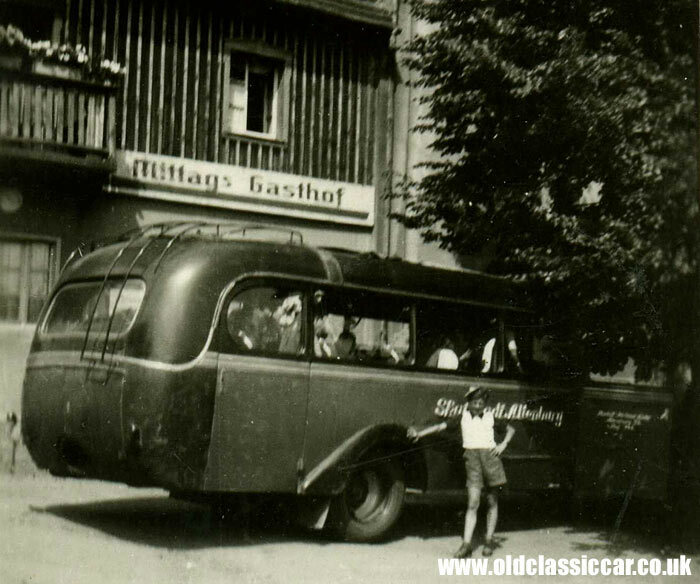 Not much to go on with this photo sadly, showing a motor-coach somewhere in Germany at a guess. 135. How I wish people would include the radiator grille in their photographs!! 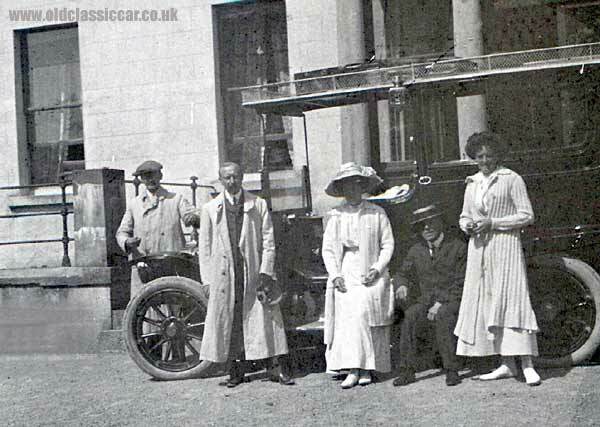 this photo shows a smart family preparing to climb inside their motor-car. Again not much to go on, other than it is probably German, and the side air vents in the bonnet may assist with identification. 136. 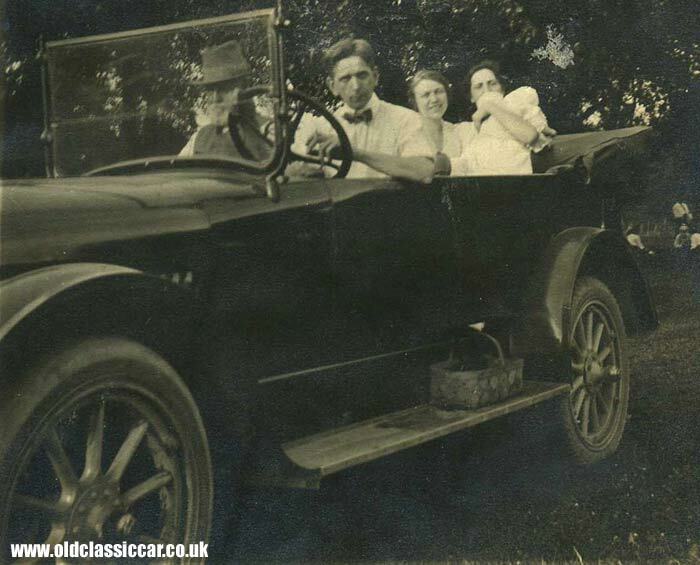 Another photo showing a family loaded into their grand looking motor-car. Again a European photo, and probably German. Can anyone suggest a manufacturer for this car. Hopefully there is enough detail to help shed some light on the car shown. 137. What looks like another large automobile, the grille badge frustratingly just out of sight!!! Note the minimal amount of tread visible on both the spare, and also on the front tyre. Marks thinks it could be a Fiat 521. 140. 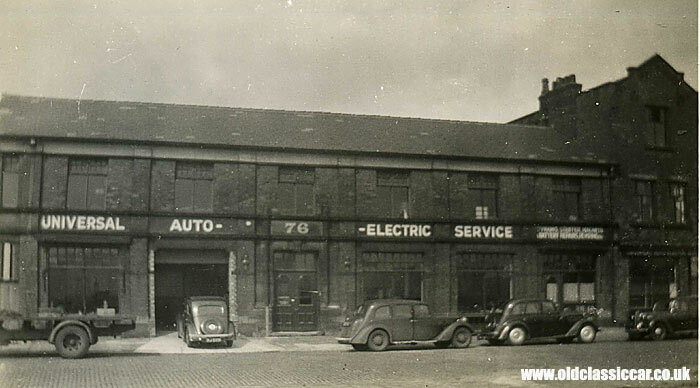 A selection of old British cars parked outside Universal Auto Electric Service. Does anyone recognise the location, or the business shown here? 141. 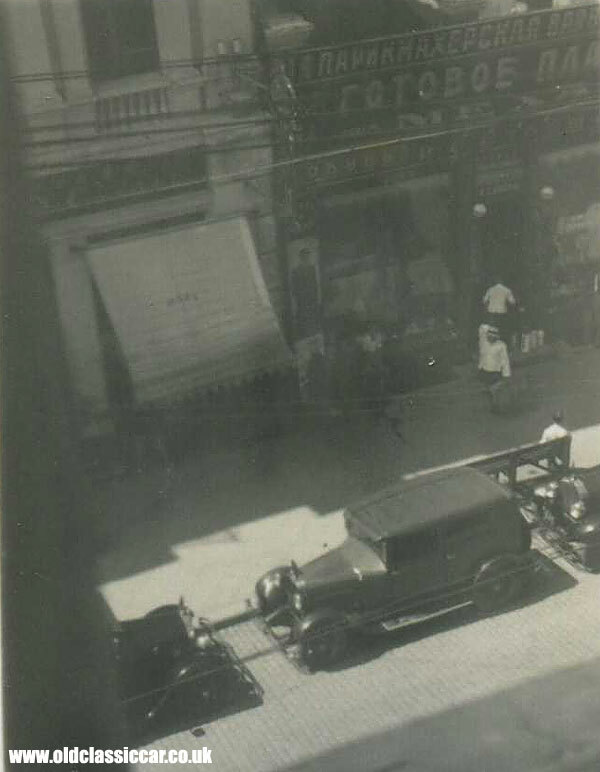 An overhead view, showing some cars parked outside a row of shops - but in what country, does anyone recognise the language?? 144. An old car, possibly German, in the background of this photo. Fortunately the grille badge shape can just be made out, which may help with this one. 145. 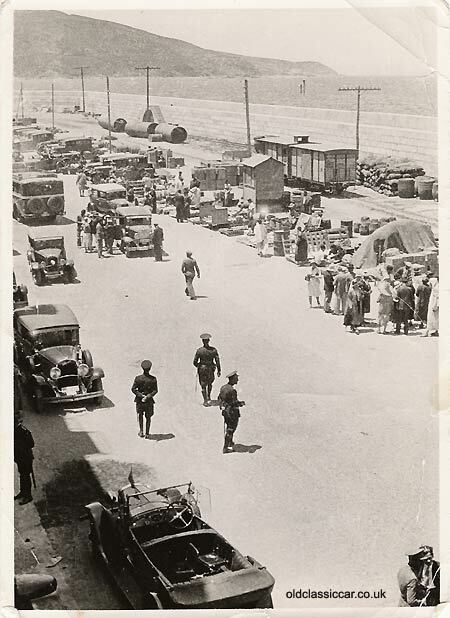 Again German, this photo was taken in May 1939, not long before the outbreak of WW2. 146. An unusual van this time. I think the script on the radiator begins with S - Steyr perhaps? I did wonder if this could be a post office vehicle? 148. 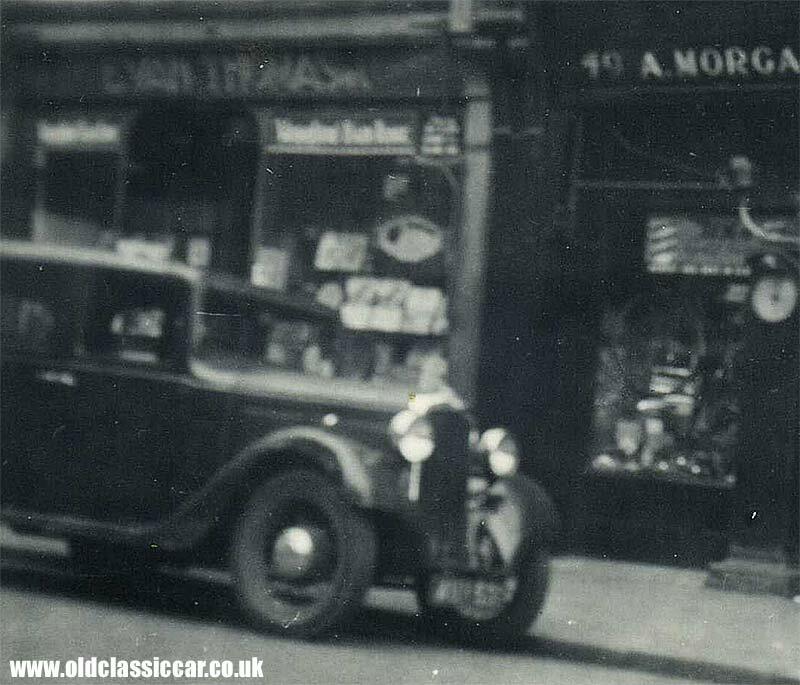 Sadly a bit fuzzy this photograph, but perhaps there is enough info to identify this 1930s Brit motorcar, parked outside a row of shops. 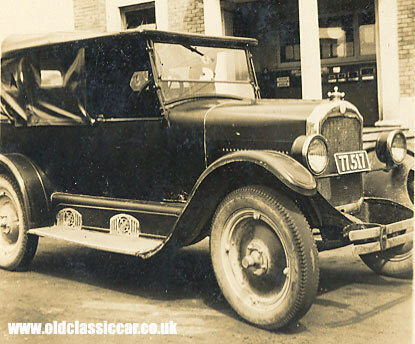 John R has had a go at this one: "I think there's a strong chance that this is the 1932 to 1935 type of Hillman Minx, and I would say that it pre-dates the 1934 facelift as it still has the upright radiator grille". Thanks John. 150. Possibly in Czechloslovakia. Is this a car, or perhaps a van or taxi? sadly in the shade perhaps there are a few clues to be found still? Jakob thinks the car behind is a Skoda, with an Opel in front. 151. This car has been the subject of some debate on the oldclassiccar forum. Latest theory is that it is a DKW. Initially the F7 was suspected, but now alfanut has come forward with the suggestion of it being a DKW F2. Any DKW gurus out there? 156. Ann sent this fabulous old photo over. Again, anyone recognise this fine old car? 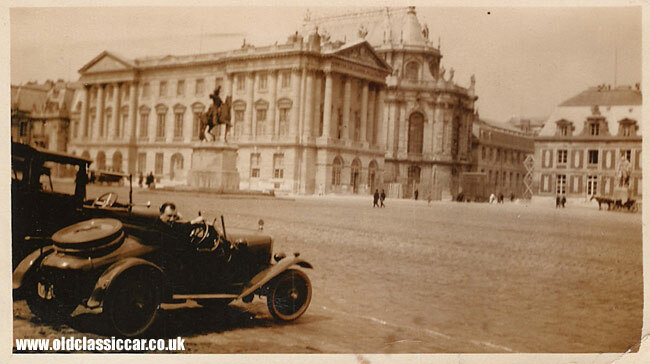 Bozi got in touch, thinking it could well be a circa 1914 NAG Landaulette, or possibly a Taxi. 157. Gary in British Columbia sent this photo in, adding ".. photo taken at the "Hollow Tree" in Vancouver BC, estimated period: 1910-30. The radiator cap seems a spoked wheel (1925-27 Dodge? ), no bumpers, right hand drive, doorless roadster". 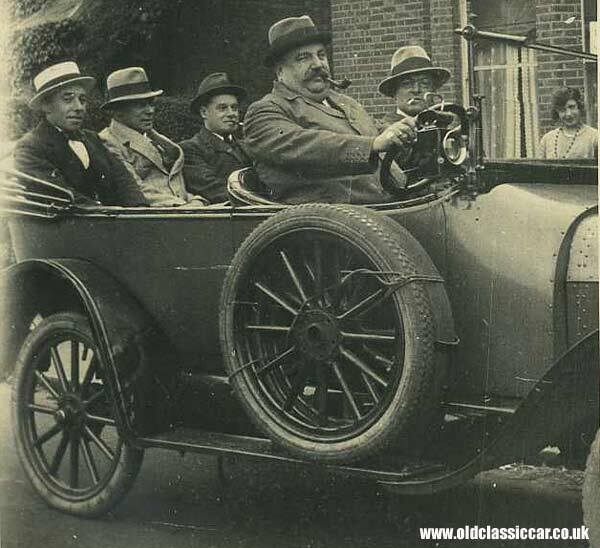 Anyone recognise this rakish motorcar? 175. A seaside shot now, with a Prefect, a Morris and a Ford 8 parked up. But does anyone recognise the resort? Denis thinks it could be Swanage. 176. 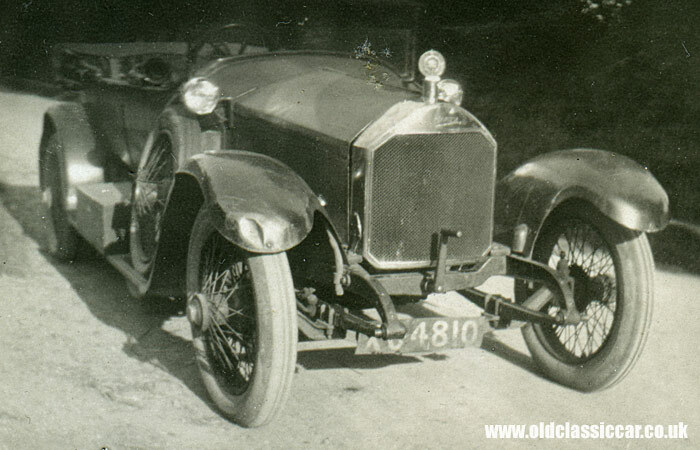 Side on view of a sturdy 1920s motorcar, but does anyone recognise what it is? 185. Sent in by Ros (NZ). 196. Back to cars now, and this 1920s' tourer. 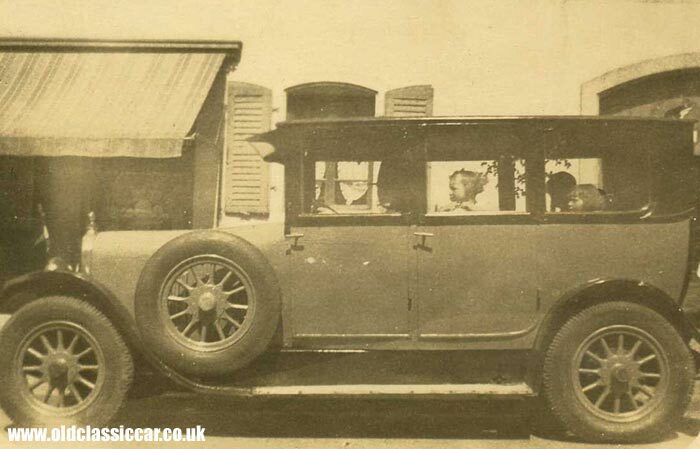 Hugh sent this in, thinking it could well be a Durant .. "In the early 1930's my late Father owned two Rugby cars. I believe they were about 1924 and 1930 models. The fabric top tourer may well be one of them. The history of Rugby cars in interesting. 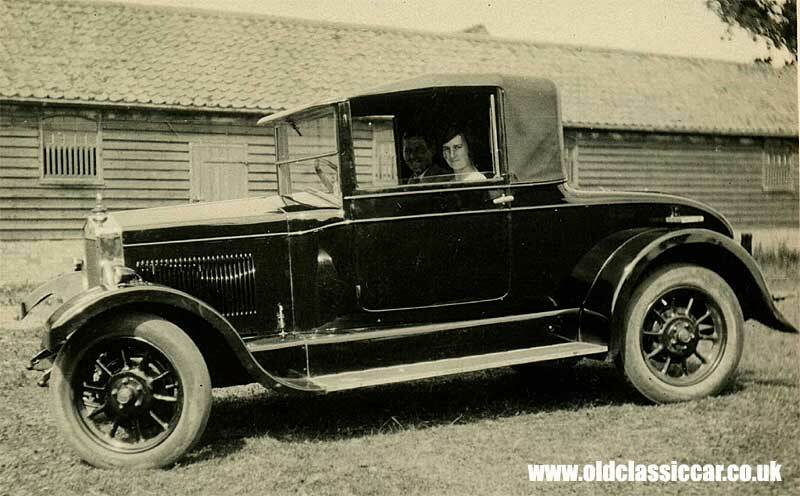 They were in fact American Durant Star cars, but exports were rebadged "Rugby", due to the name Star being copyrighted to another British car company ... it would appear that the car is a 1924 or 1925 "Durant Star K Special Sport Touring" car, rebadged as a Rugby. This model appears to be the only one with those imposing steel wheels, the remainder of the range having wooden artillery wheels. Perhaps you or one of your readers can help with some more information". Can anyone confirm this identification, or add to the info that Hugh has? 197. Back to some of my own photos now, starting with this two door tourer, with dickey seat. One suggestion is it could well be a Fiat 509 - anyone know for sure? 201. Not a great deal to go on here, just the rear of the car is visible. However perhaps the spare tyre, incorporating the wheel rim, may help identify it? 205. 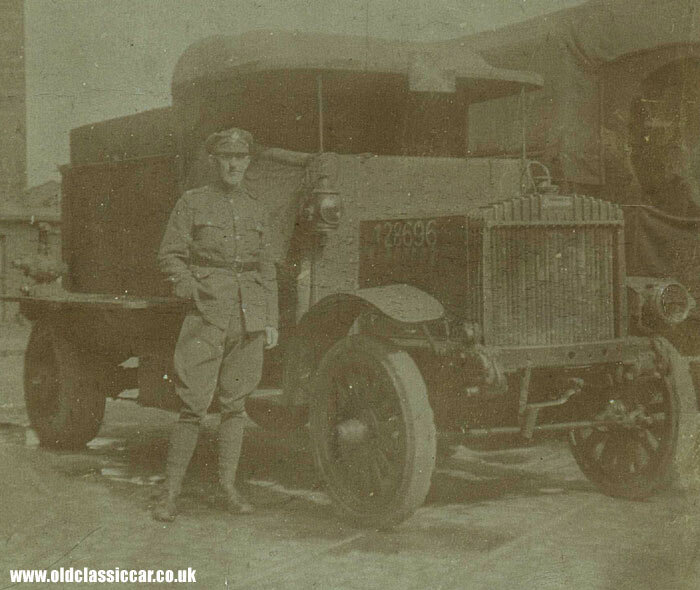 And a military lorry, circa Great War I think, seen with a soldier stood in front of it. Lloyd: "a Riker, but badged as a Locomobile - who were the makers of Riker anyway". Thanks Lloyd. 206. Michael Greenwood sent this photo in, it shows family members parked up in the Nilgiris Hills in India, apparently the car was on long-term hire at the time. Can anyone confirm make and model of car? at first I thought Model T, but now I'm not quite sure....Ron came up with this suggestion: "Early Chev,around 1920 with a 1926 or 27 Model T Ford radiator and bonnet, and Model T steering wheel turned upside down." 208. Keith Konopka sent this intriguing photo over, it was taken circa 1941 - hence the blackout mask fitted to the nearside headlamp. Does anyone recognise this sporting car? Again, something about the radiator looks familiar, but I can't put my finger on it! Keith wondered about it being a Singer, but I've not found any old Singer to match this one, so does anyone recognise this car? 209. 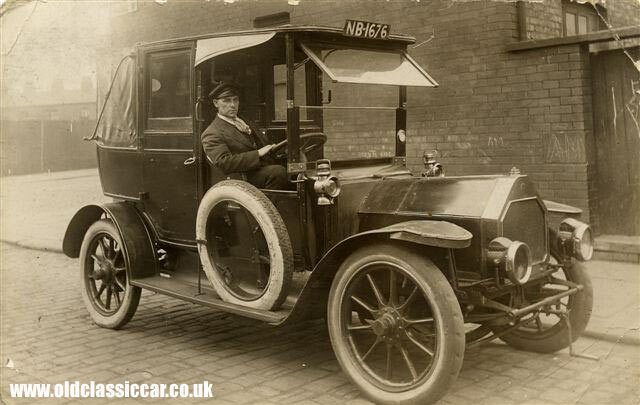 Paul Edwards sent in this photo, it shows his grandfather behind the wheel of a taxi produced by ??? My first thoughts were Napier or Unic, but I'm sure someone out there will know for sure. The registration code (NB) confirms Paul's thoughts that the taxi was photographed in the Manchester area. 210. A photo from my own albums now, showing a cluster of people stood alongside ??? what car?? the deep headlamp bowls look American to me. 211. Another of my old photos. Maybe someone will recognise the unusual hinge rivet layout on the bonnet? or the large 3 stud artillery-type wheels, fitted with Dunlop Cord tyres? 213. Roger sent this old photo in. He thinks it was taken circa 1928. His father (in the passenger seat) remembered the family owning a Vulcan in the dim and distant past - could this be the Vulcan?? the photo was taken in the Southport area, home to the Vulcan motor car factory. 217. 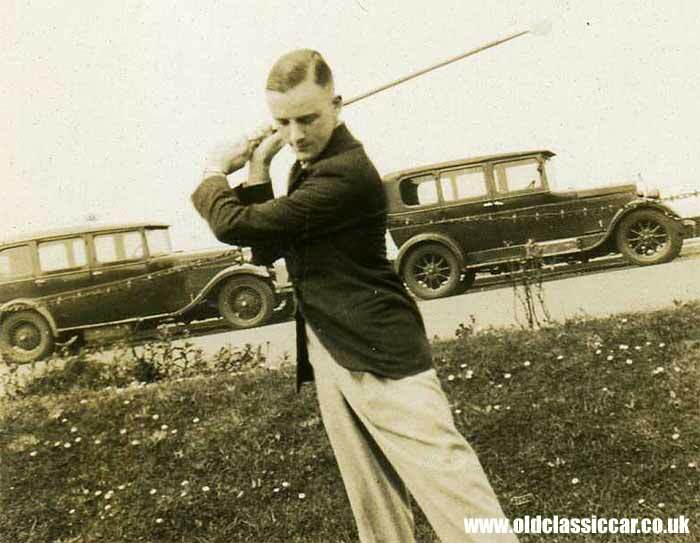 A well-groomed chap is seen here practicing his golf swing, but what are the two cars in the background? 218. 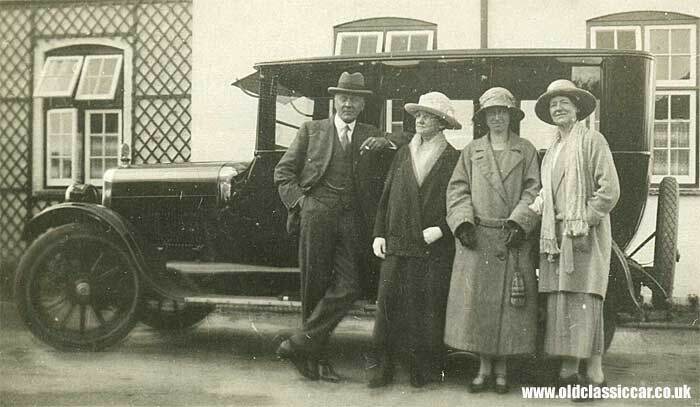 A smiling lady is seen about to board a two door tourer (plus dickey) in the 1920s. Not much to go on but does anyone recognise it? also note the early pram just to the right of shot. 222. 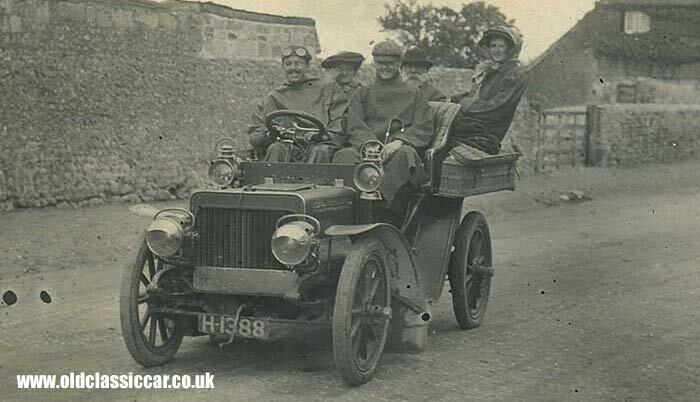 John Culver sent this one over via email, wondering what car is shown - Humber maybe? 223. Laurie sent this pair of pictures in from Australia. So far it has been identified as an Austin, a Clyno and a Swift!! so he's keen to find out for sure what it is .. "I have always believed Grandad's car to be an Austin: he kept it under cover in the garage during the war... it was the love of his life." 230. Lyndon emailed this motorcycling image over, and adds: "I have enclosed a similar photo from the same period as #195. Again it is likely to be a Matchless but could be something else, like a Coventry Eagle or Excelsior. Please ask your readers. This image was sent in the 1950s (postcard about 1905) and reflects on a journey from Southampton on the back of this monstrosity. I assume the bike was local as AA was, I think, a Hants. registration. The pillion recalls going over the 'dog's back' and says that her rump was rendered 'useless'. Thankfully she says the belt came off the pulley and she had some recovery time. They bounced their way on towards London on the old Coach track to London now the A3." 232. Emailed over by Peter Williams just as I was updating this page, a photo of a chauffeur behind the wheel of a ???? (Napier perhaps? 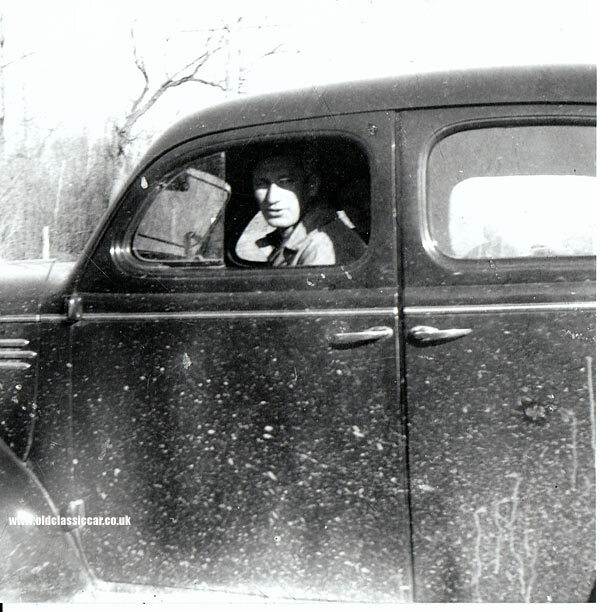 ): "I am trying to identify the car in the attached photo. which was taken in Upton, near Birkenhead, in what was then Cheshire. The chauffeur was my grandfather, who died in Dec. 1910, which should narrow it down a bit. 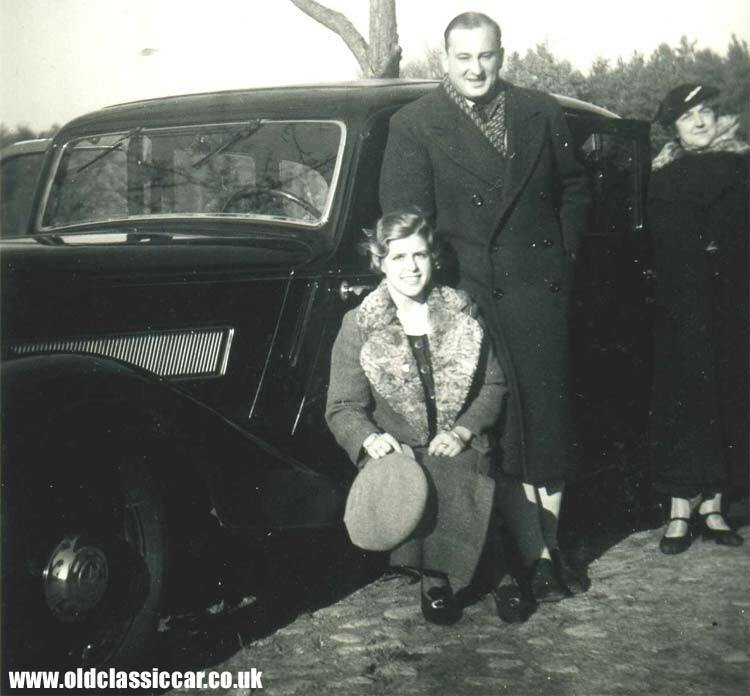 I was told that he converted from coachman to chauffeur doing a course at the factory.It would add a bit more to the family history if you could help." 233. 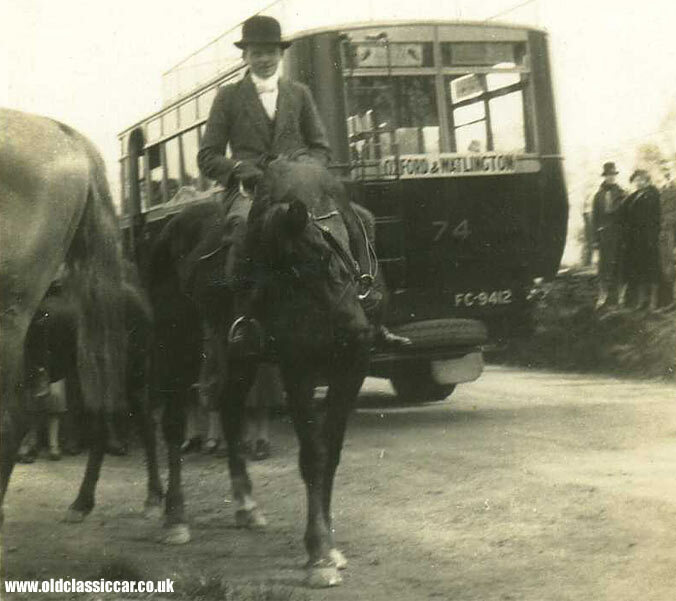 An old country bus photo now, showing a single decker bus, in the Oxford and Watlington area. Lloyd is certain that it is a City of Oxford Motor Services bus. 234. 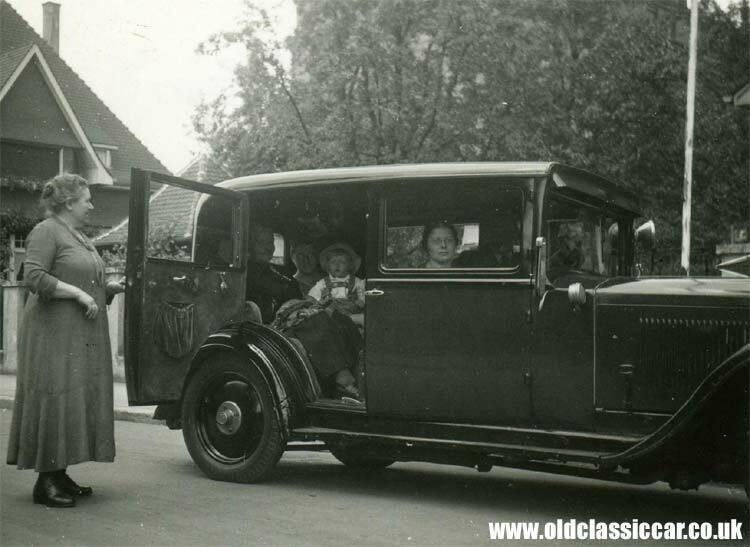 What looks like a vintage taxi, with a lady on board - a Fiat perhaps? the spare wheel, sunk into the running board, rings a bell for some reason. 236. Robert Chambers found and emailed this one over, he says: "Found this photo of a car my great great grandfather owned in St. Paul, Minnesota USA. But note steering wheel on right, not left. Was in a scrapbook of photos dated 1904." 238. 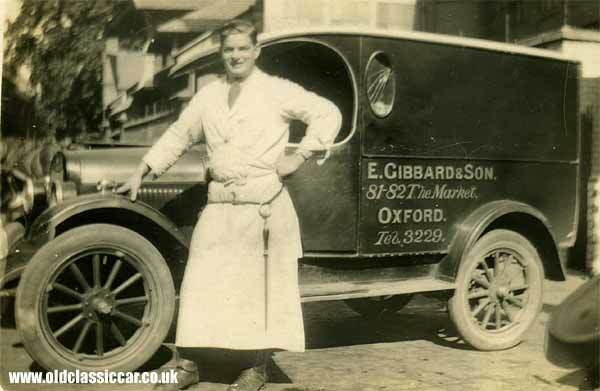 Van time now - in the livery of E. Gibbard and Son of Oxford .. one suggestion is Chevrolet. 239. And a group of people now, stood in front of a smart half-cab coach. 241. A sporting number now, a Lotus - possibly based on a 23b, but with a closed roof. Does anyone recognise it for definite? 242. 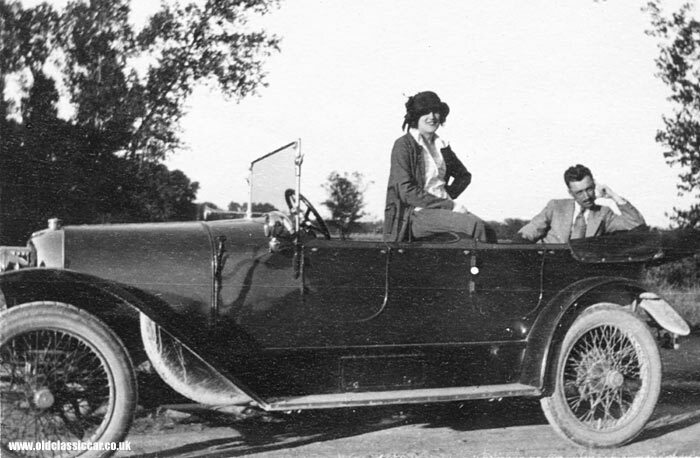 A small vintage car now, with two people on board. 246. 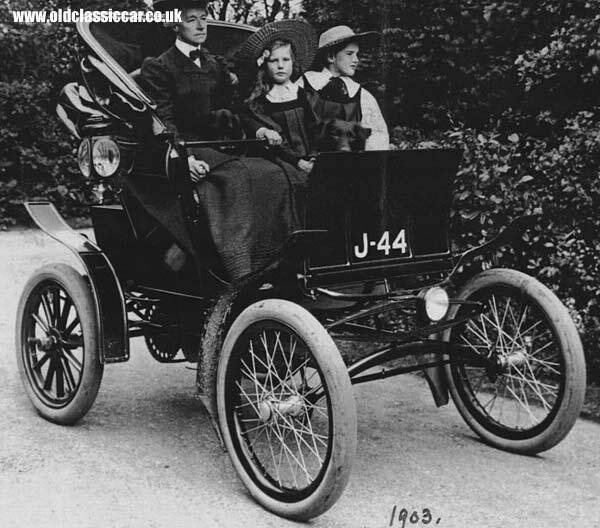 An early veteran car now. This one has had a few people scratching their heads already - one suggestion made is Lloyd & Plaister, a tiny firm that produced only 50 or so cars between 1900 and 1911. 247. Another group shot, of people in their car. 248. 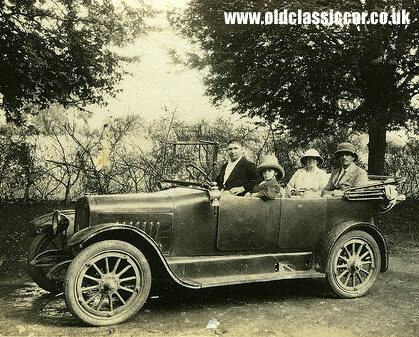 A group of gentlemen sat in their tourer - one suggestion is that the car might be a re-bodied Model T Ford ...? 249. 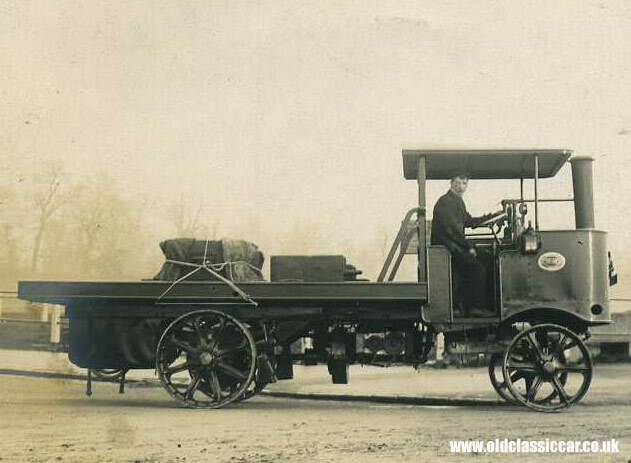 Next, an unidentified steam lorry. 250. Is there enough to help id this vintage car? 253. Something totally different now - a classic dump truck! 254. 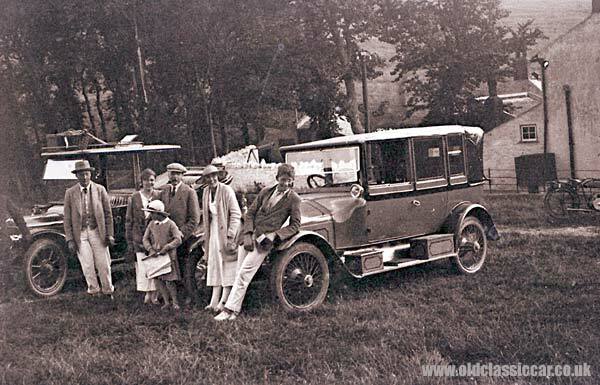 Two photos now, of a family with their 1920's tourer. 255. John and Rae emailed these photos over, can anyone provide an identification? 258. 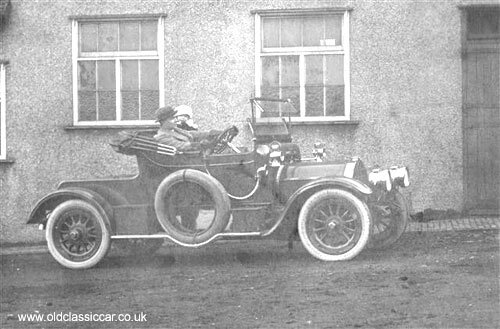 Bill R sent this over, apparently it was used on a tour of Europe in 1913, but no more information on this car is known. 259. 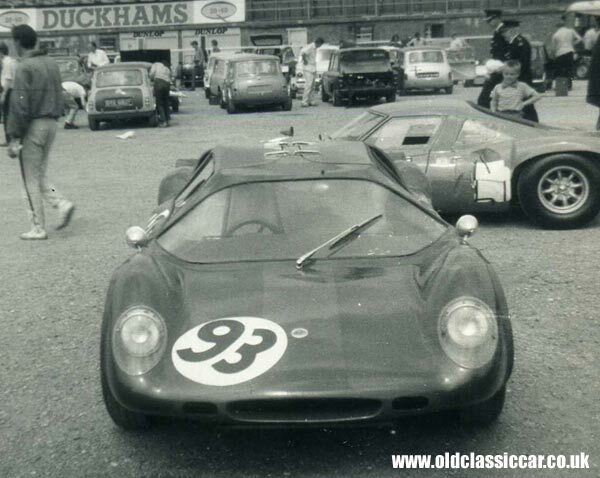 Tricky one this, but perhaps someone recognises this car from the section in shot? 260. Thanks to Frederic for emailing this next query over. 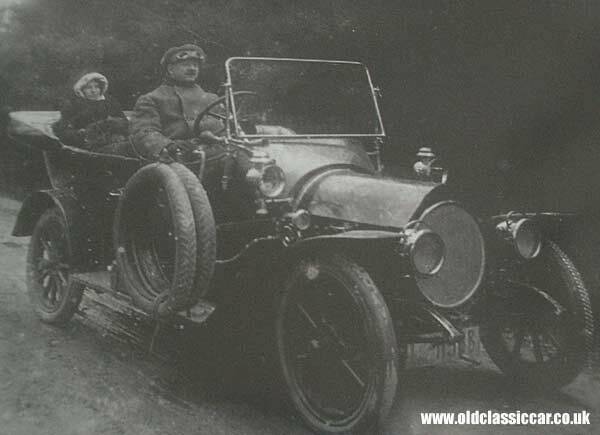 The car belonged to his grandparents, the photo was taken in France, 1922. 261. Now a nice clear shot of a veteran car. 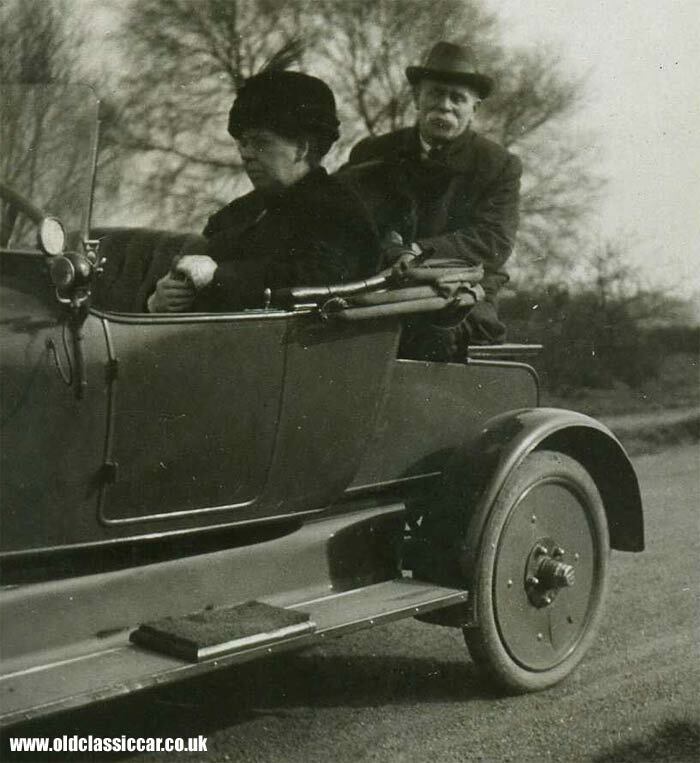 Peter's grandmother is seen behind the wheel circa 1910/1911. 262. 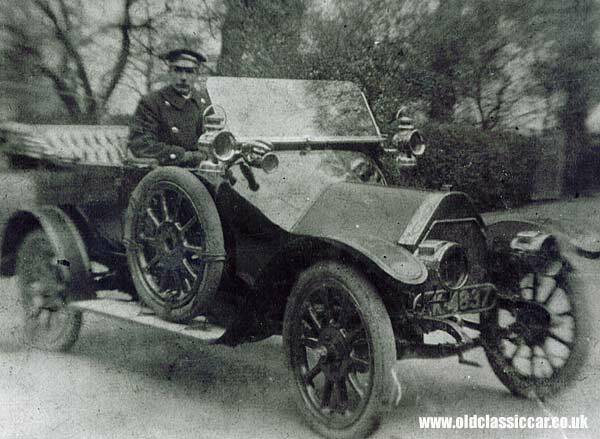 Nickie sent this one - does this chain-drive veteran car ring a bell with anyone? 263. 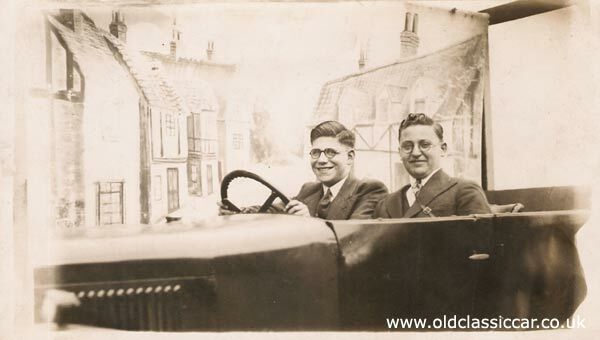 This photograph shows Jim's wife's grandfather who was a chauffeur, he wonders if anyone can identify it? Humber possibly? 264. 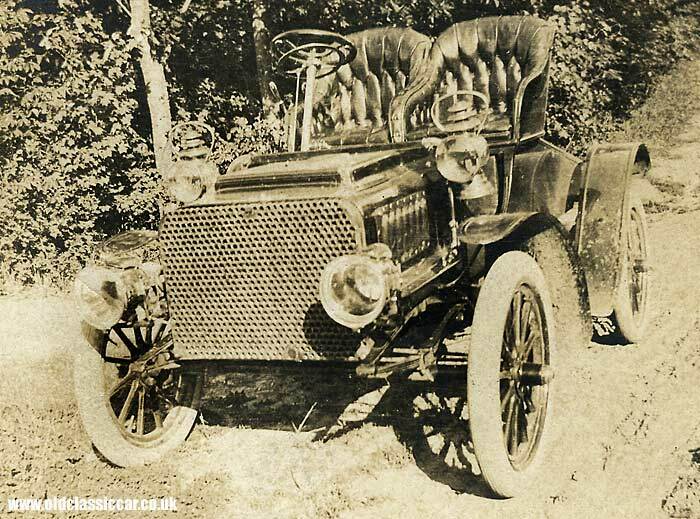 Thanks to Alex for this next mystery car, photographed in Germany circa 1909/1910. 265. Tony in Australia sent this photograph, it reminds me of a Buick - but is it?